Let’s start planting! My colors for the Delphiniums are mixed and ready to go. The recipes are as follows: #1. Three mixes of Magenta + White. #2. A couple of combinations of Ultramarine Blue + Dioxazine Purple + White. #3. Two shades of Dioxazine Purple + White. Since the water is still a little wet the thick brushstrokes of the tall, stately Delphinium blossoms are gently “Laid” on top of the color underneath. 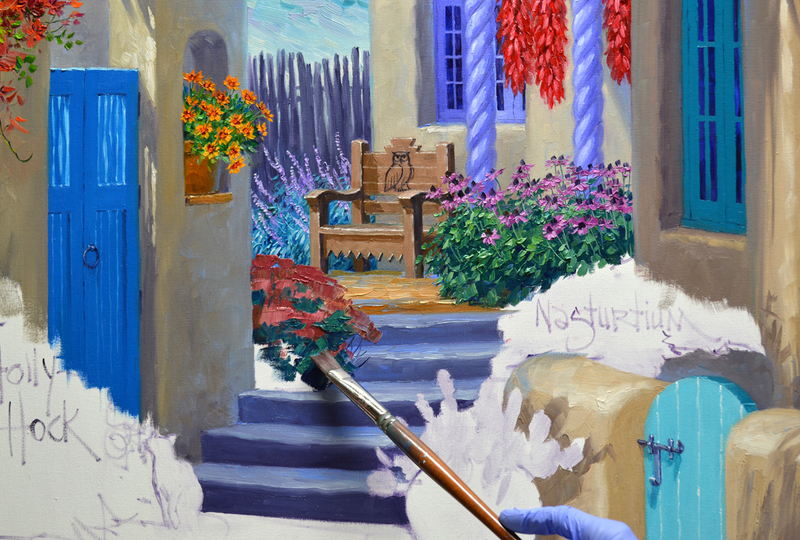 I don’t want to pull up any of the background paint and muddy the rich color of the flowers. Leaves and buds are made of mixes in different proportions of Sap Green + White. Please remember as you read through my blog, you may enlarge any of the pictures by clicking on the image. 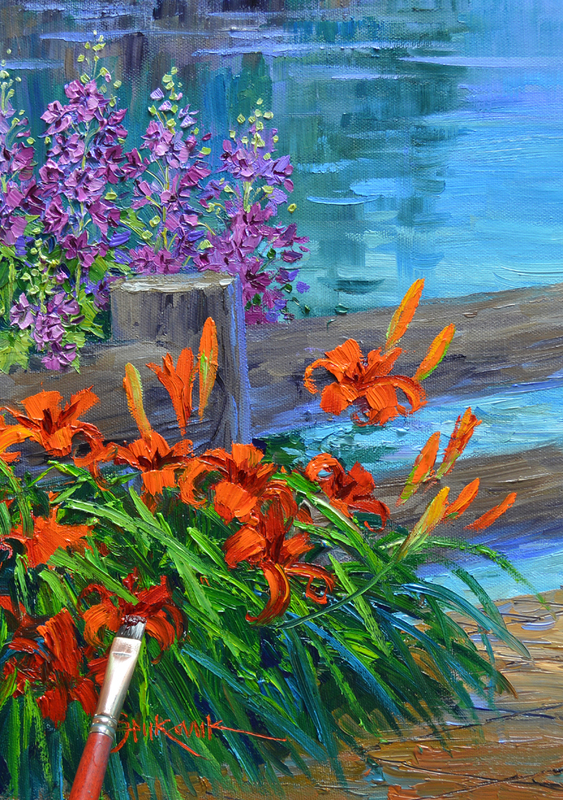 The Red Orange Day Lilies are painted in the same sequence: Flowers First, Leaves Last. A brighter green, made by combining Pthalo Blue + Lemon Yellow, is used for the long, strap-like foliage. 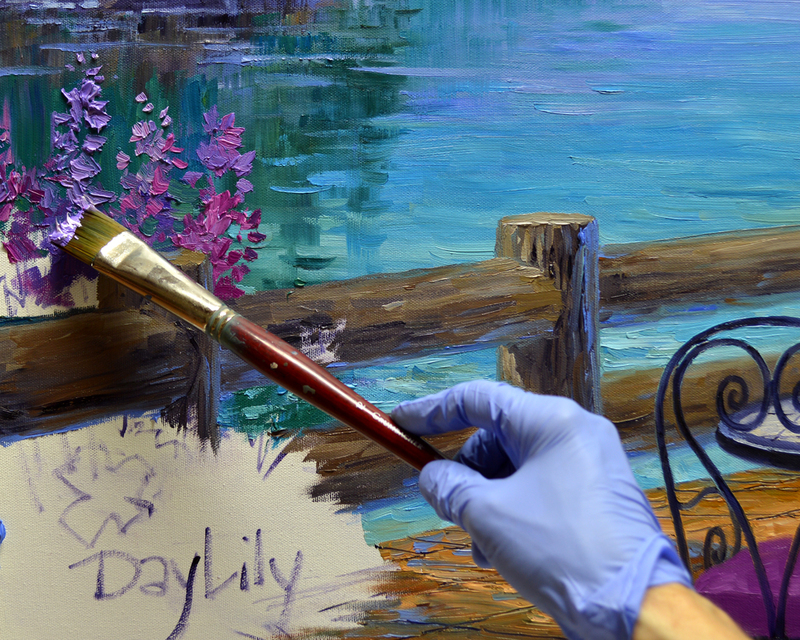 Deep centers are sculpted into the thick paint of the Lilies with the corner of a medium Bright (square) brush dipped in a mix of Alizarin Crimson + Liquin. 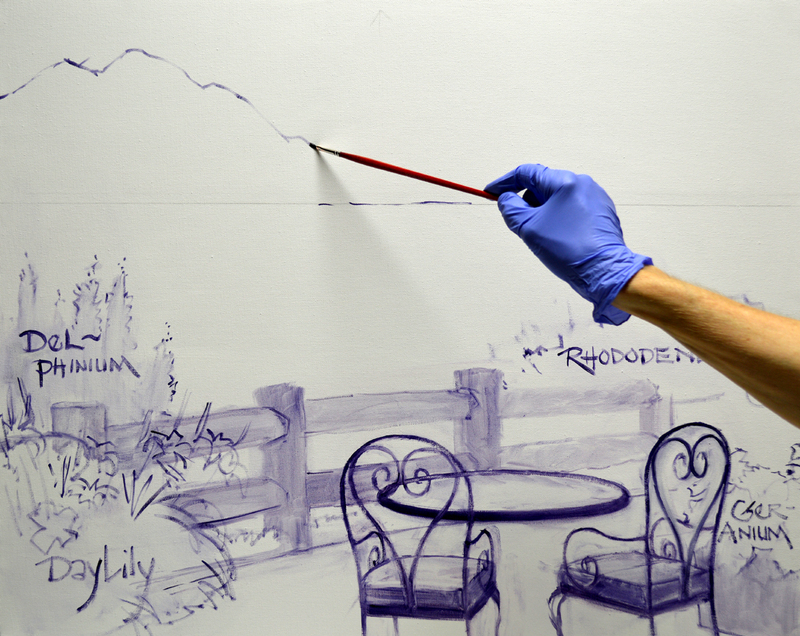 Then a fine liner brush is used to draw the long flower stems into the wet paint. Geraniums fill the terra cotta container by the table and chairs. 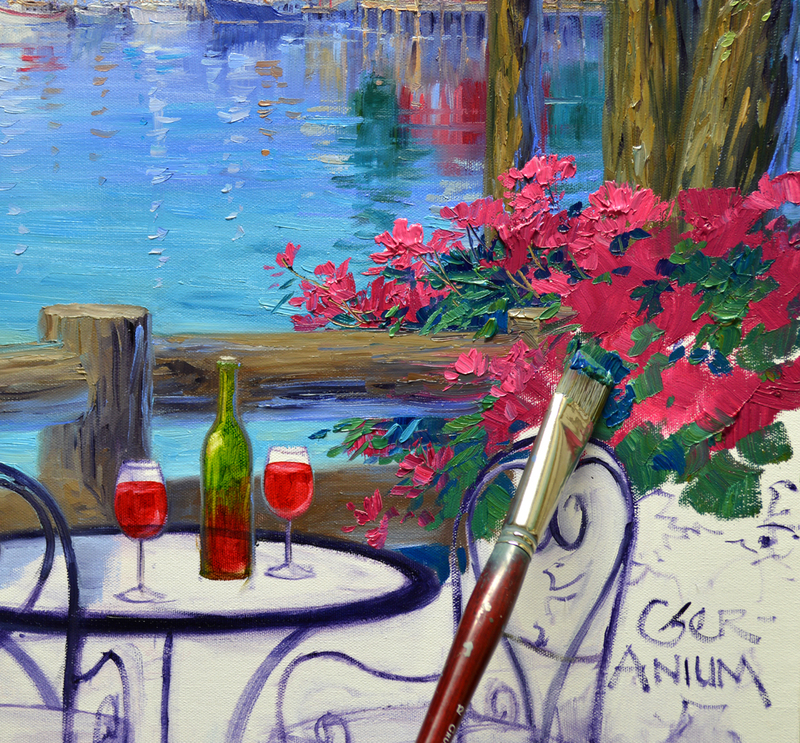 The flowers are made of various mixes of Cadmium Red Deep + Magenta, Cadmium Red Deep and Cadmium Red Deep + Cadmium Red Light. Greens leftover from the Day Lilies are used for the Geranium leaves. 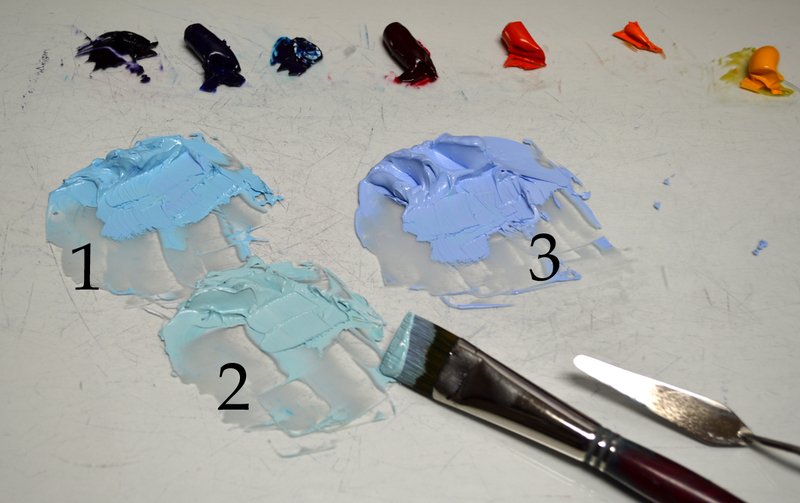 You might have noticed all of the little dabs of paint lined up on the left side of my palette in the first picture. 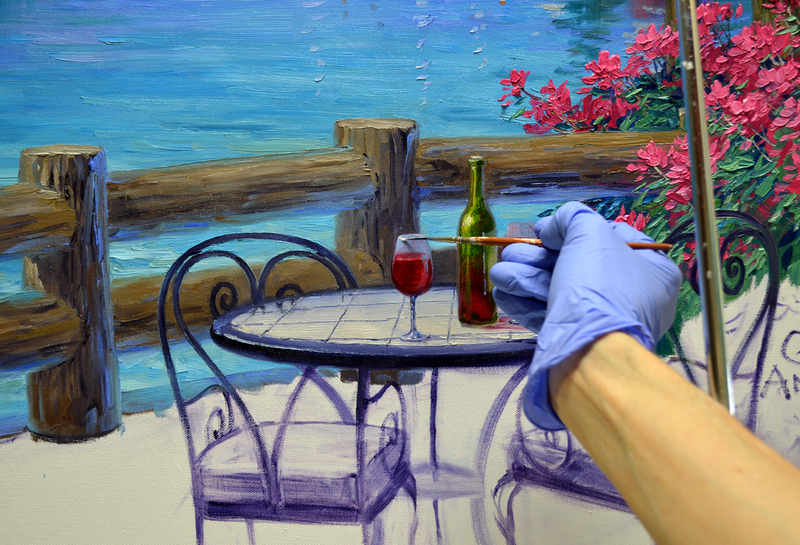 One of the joys of working in oil paint is that I can save it on the glass surface for several days. 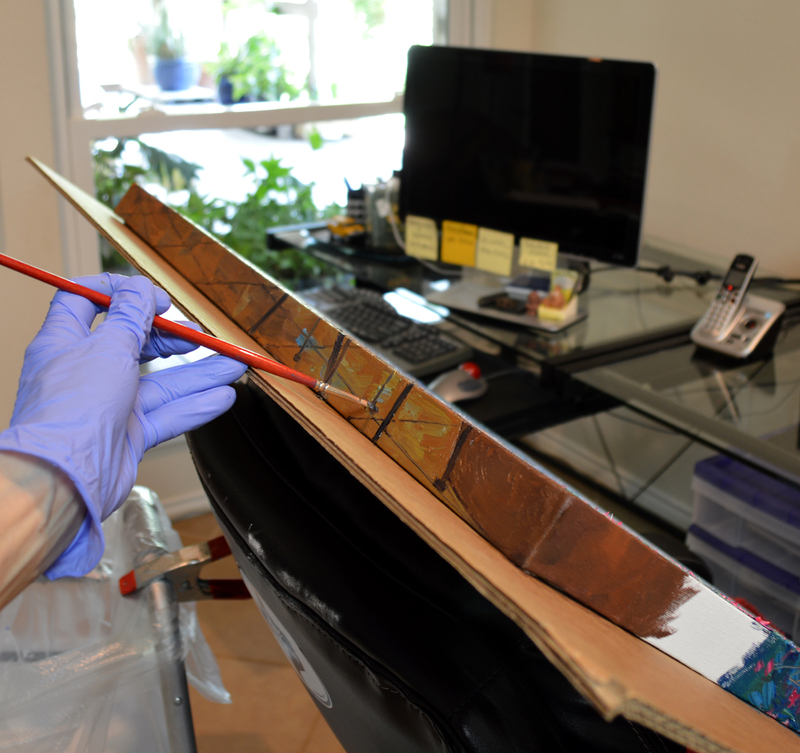 It may develop a thin film on top but I can dig out fresh color with the tip of my painting knife. I decided the sky looked a little plain. 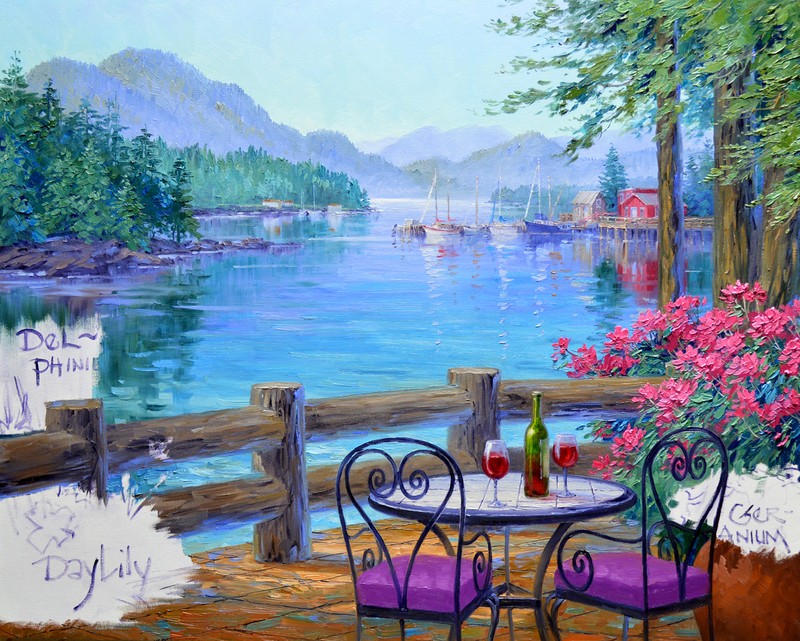 SO…..I used some of the lightest sky color to paint a few soft, hazy clouds hovering over the distant islands. The table top is tile. 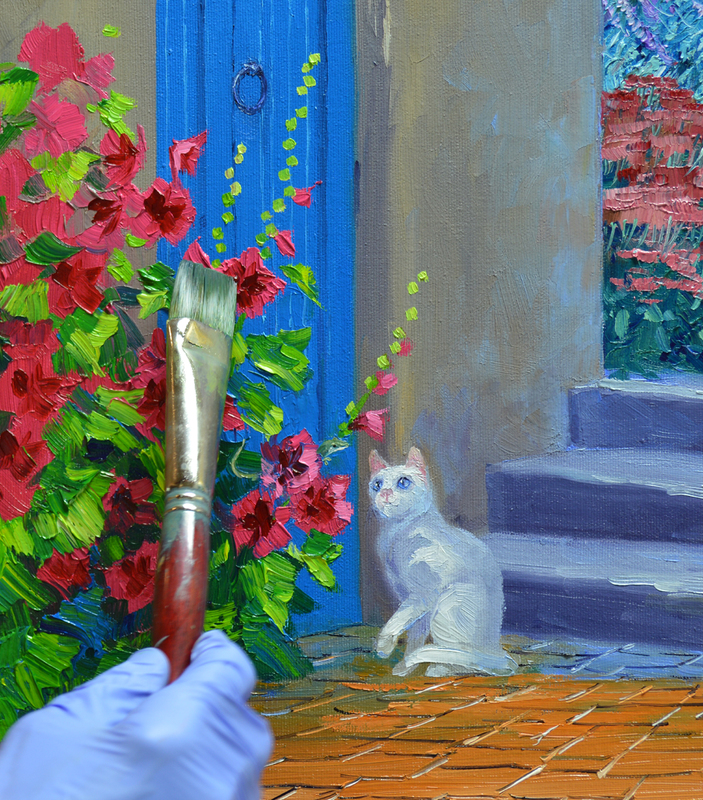 The surface is painted with warm whites made of White + Ultramarine Blue + Cadmium Orange. 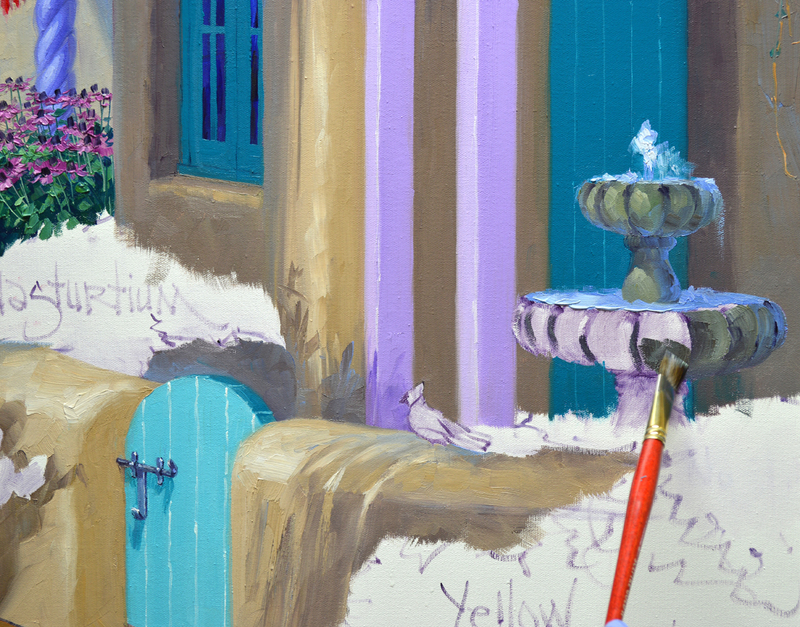 The mix used toward the back edge has more Ultramarine Blue, that used at the front has more White and Cadmium Orange. 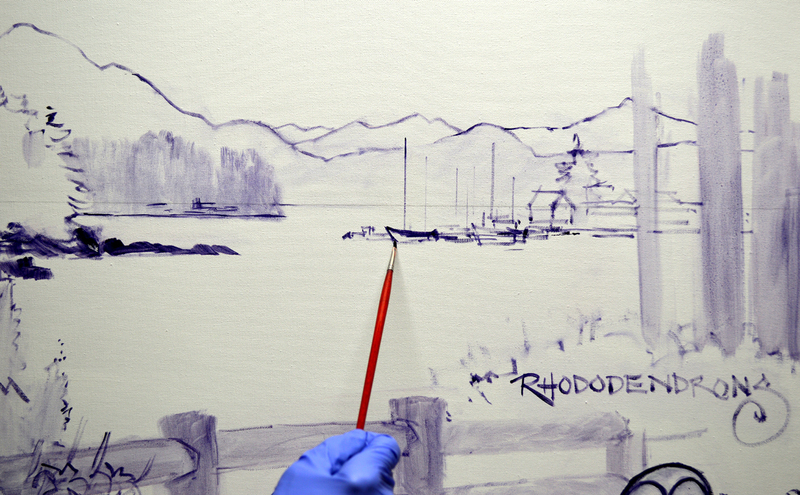 Then perspective lines are drawn into the wet paint with a fine liner brush. These lines act as a subtle pointer, directing the viewer’s gaze to the marina in the background. 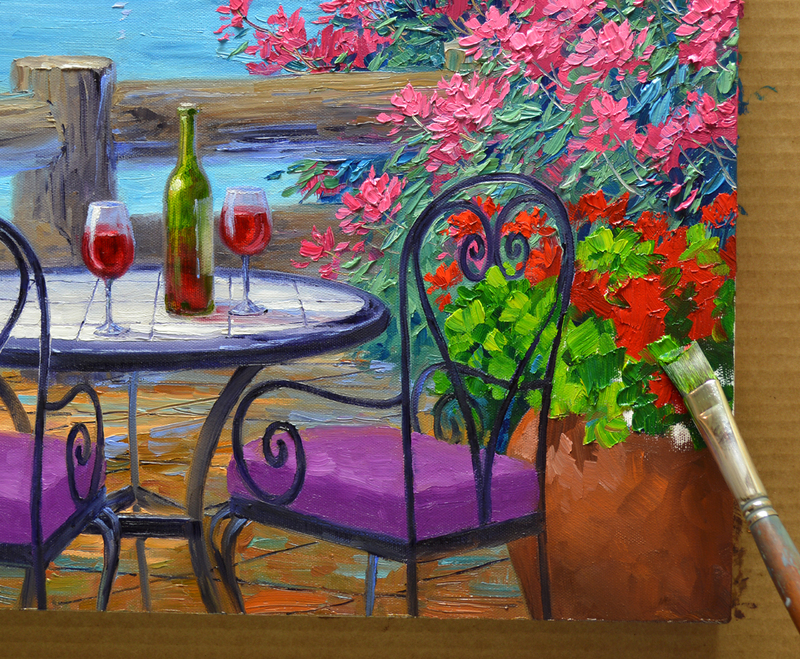 The wine bottle and glasses are now completed. 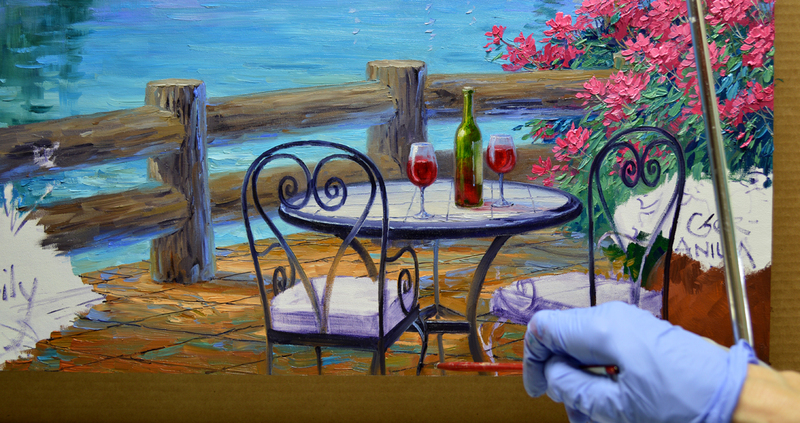 My wrist is braced on the mahl stick to steady my hand as I place the highlight on the rim of the glass. The floor is also tile. The light and shadow pattern on the terra cotta pavers is first painted. 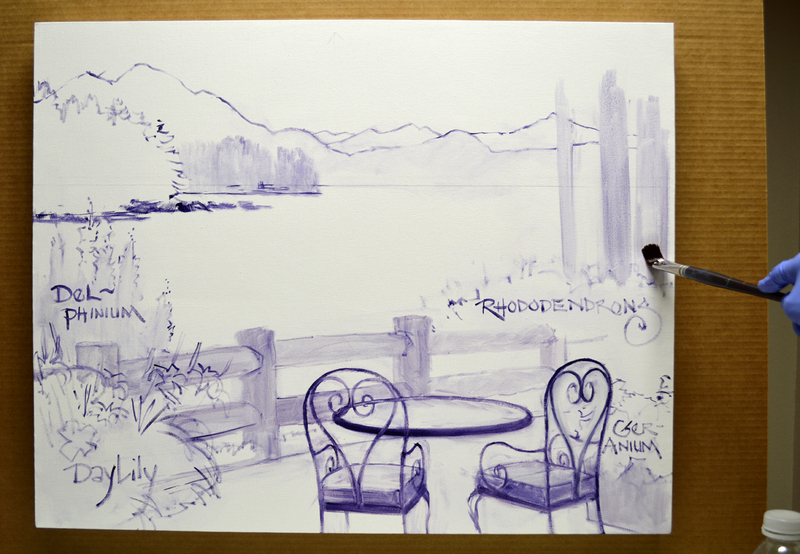 I carefully work around the chairs and table, I don’t want to lose my original drawing. Fortunately the sketch is dry so I can wipe off any paint the covers over it. Perspective lines are now pulled into the floor. I’m using different vanishing points than on the table, so the lines are on a different angle. OK, just what do I mean by the title of this post, “LEGLESS?” Well…. 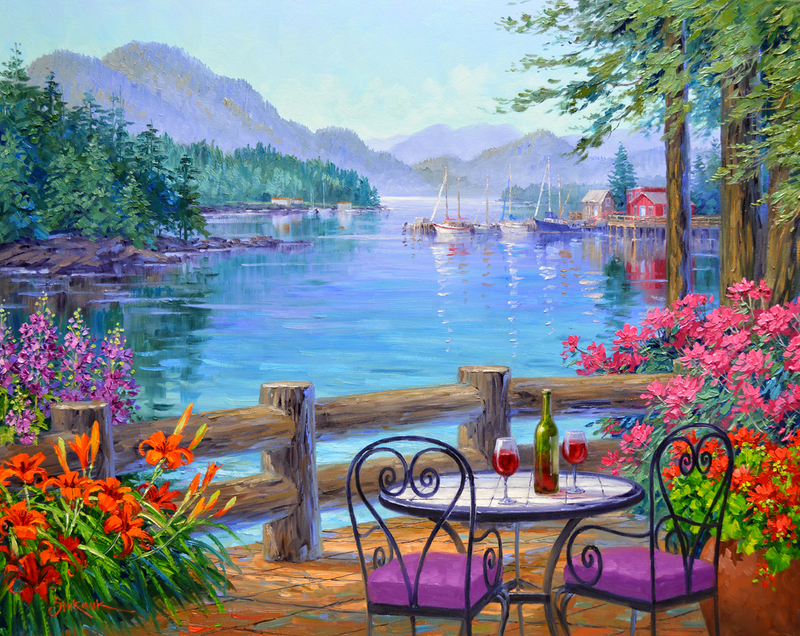 one of our followers asked why I wasn’t showing the legs on the chairs in the painting? Actually I am, they just will extend over onto the lower edge of the canvas. If I showed enough of the courtyard to include the entire length of the legs on the front surface we wouldn’t have had nearly as much room for the water, the main focal point. I figured the water was much more interesting than the chair legs. So here is the setup to paint the bottom edge of the gallery wrap canvas. 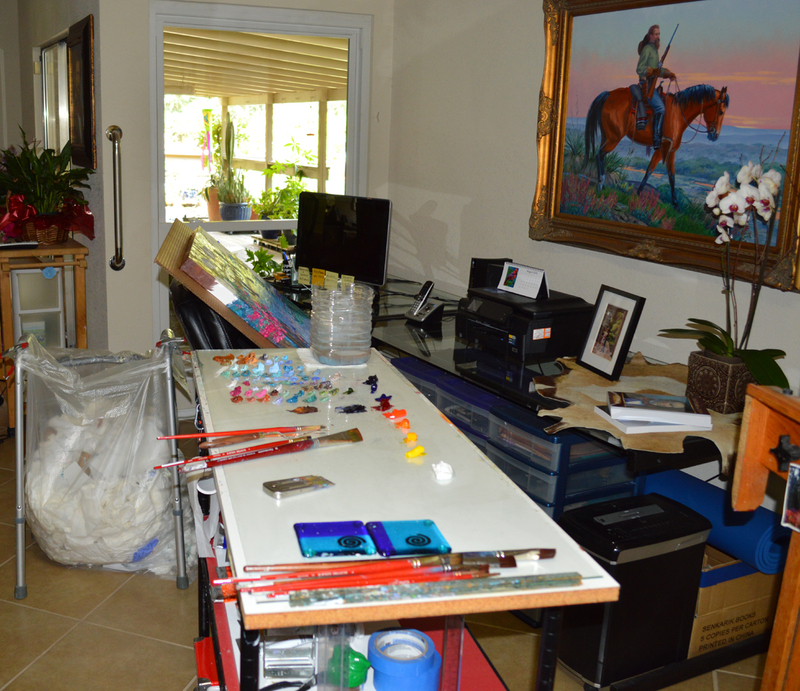 All of our studio furniture is on wheels so everything can be moved easily. That’s Jack’s desk and computer by the window. 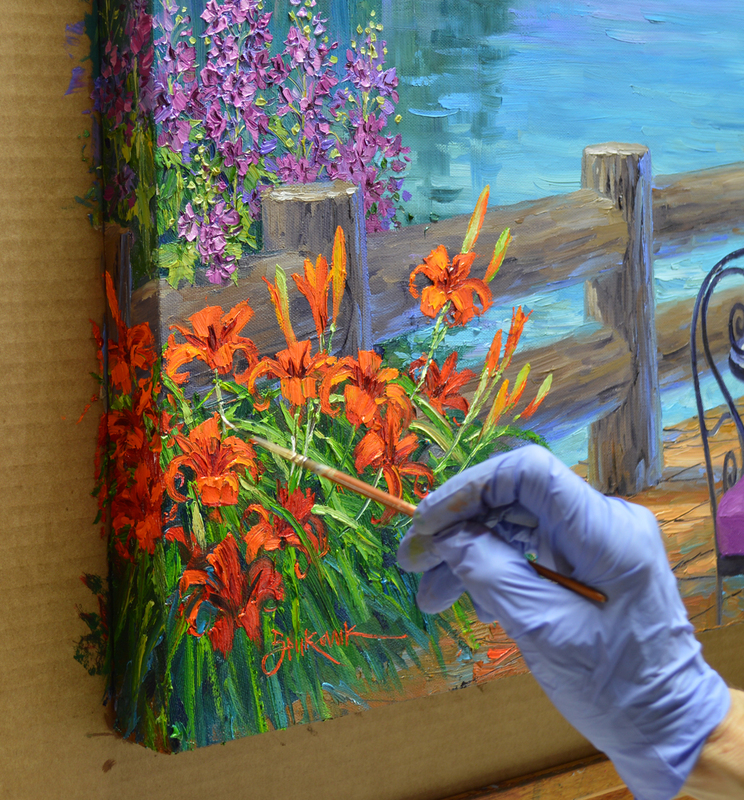 I’ve grabbed his chair and placed the painting, which is mounted on cardboard, on the arms and back. Then palette and trash bag are moved to convenient working spots. Here we are from a little different angle. 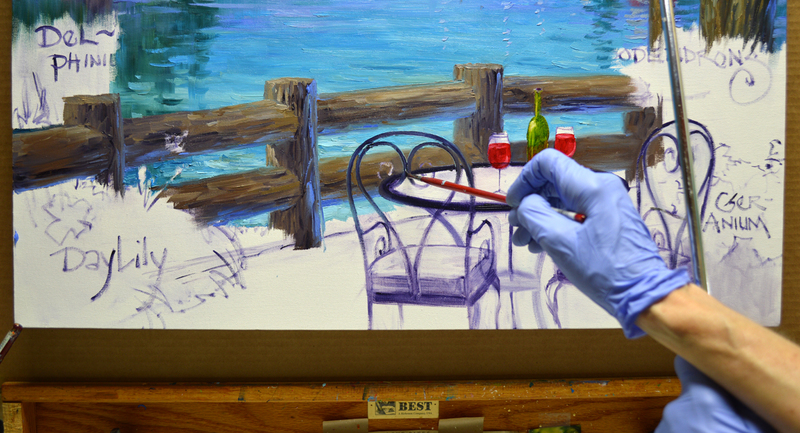 You can see placing the canvas on the seat back makes it easy to work on the surface of the lower edge. You might want to enlarge the picture to see the details better, just click on the image. Oh, the container that I’m using for the paint thinner is just another kind of water bottle, our grocery store changed the design! After the floor and lines separating the individual tiles are finished on the lower edge, the legs are drawn into the wet surface. This angle shows how the furniture extends over the side. It does take some mental gymnastics to figure out the perspective of the floor lines, as well as that of the chair and table legs. 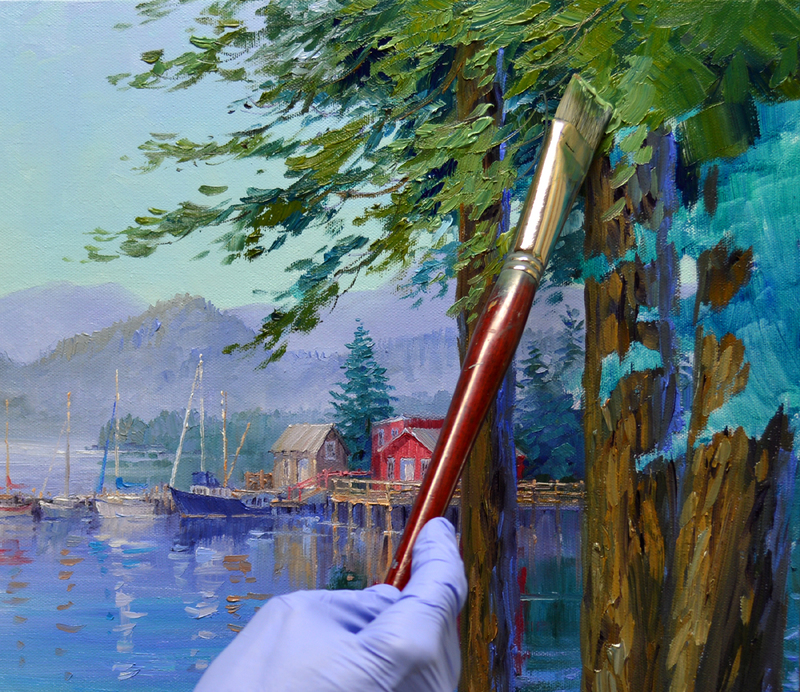 The paint on the trunks of the Fir Trees is applied with heavy brushstrokes, giving them a rough texture like bark. The shadow edge of the trunks is made bluer, giving them the appearance of roundness. You can enlarge the image to see this better, just click on the picture. 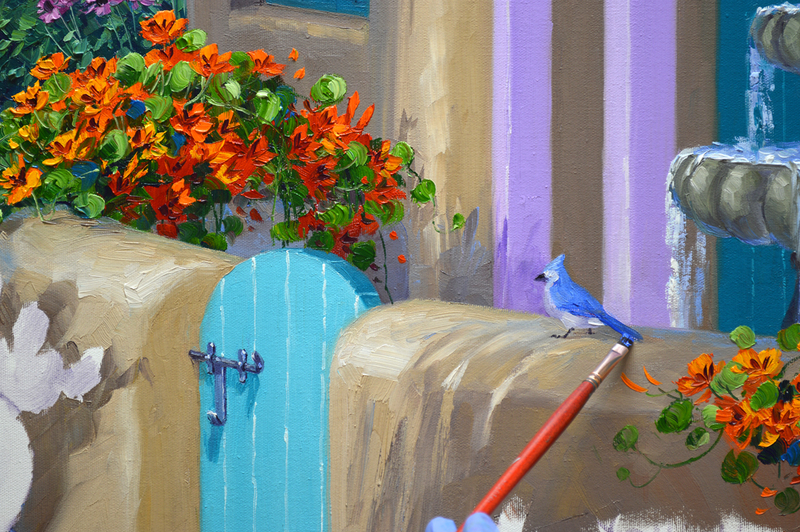 The feathery foliage is painted with mixes of Pthalo Blue + a little Ultramarine Blue + Cadmium Orange + White. 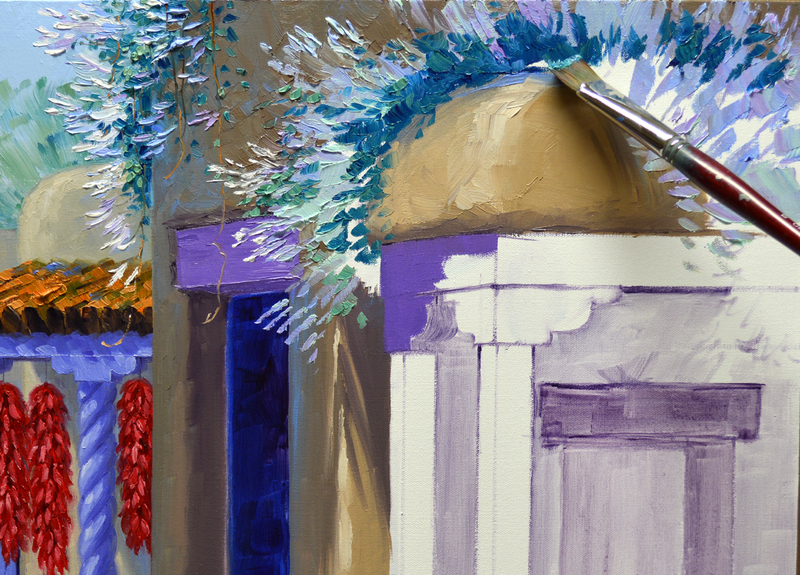 For the branches that dip down on the opposite side of the trees I add Pthalo Blue + Cadmium Orange + White. This makes those needles a little cooler so they will drop back. 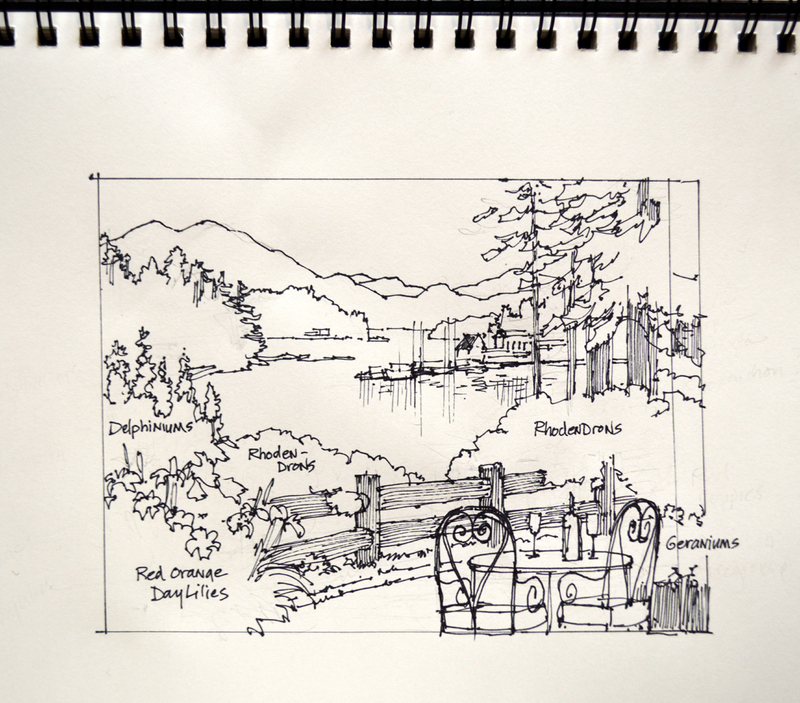 I’ve decided to remove the Rhododendron that was in back of the fence on the left side (you can CLICK HERE to see the original sketch). This way more water will be seen from the little bistro table and you’ll be able to hear it lapping on the rocks below the terrace. Just seems a bit more inviting. What do you think? After the fence is finished I draw the portion of the heart on the chair back that’s in front of the log cross bar. It’s easier to do this while the paint is still fresh; making a smooth line would be difficult after the heavy brushwork has dried. The flowers of the Rhododendron are blocked in with mixes in various proportions of Magenta + Permanent Rose + White and Permanent Rose + White. Rhododendrons are a northern shrub. Being a Southern girl I identify them with Azaleas which are fairly similar. Working wet-into-wet the leaves are added around the blossom color. I use the green to help shape the pink flowers. Work continues on the closest island. The rocky shoreline is painted underneath the thick trees. A few brushstrokes of blue from the water are added on the boulders to give the impression they are wet. 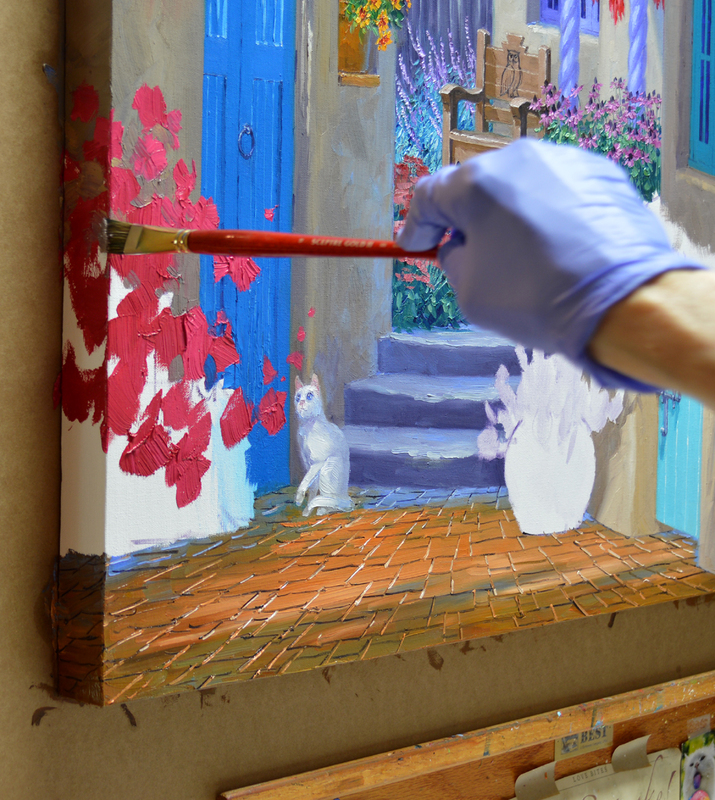 Here is another one of the “RULES” that helps to give the appearance of depth in a painting. Muted, Duller Colors Go Back; Brighter, More Intense Colors Come Forward. 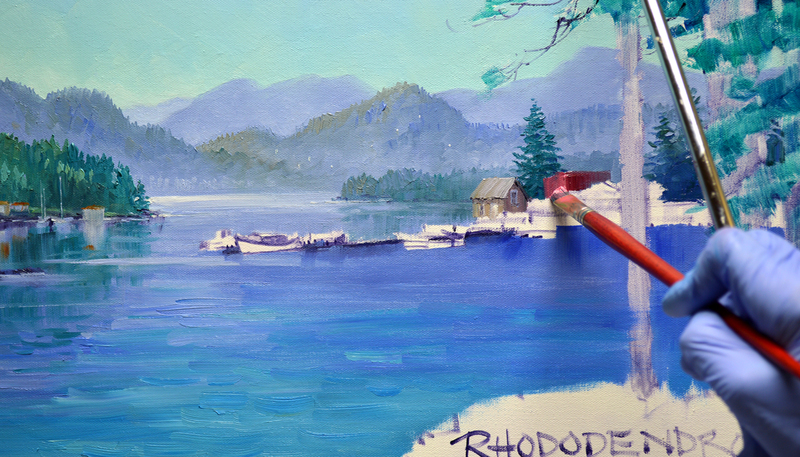 Notice how the water in the distance is a faded blue, it was mixed from Ultramarine Blue + a touch of MUD (Ultramarine Blue + Alizarin Crimson) + White. 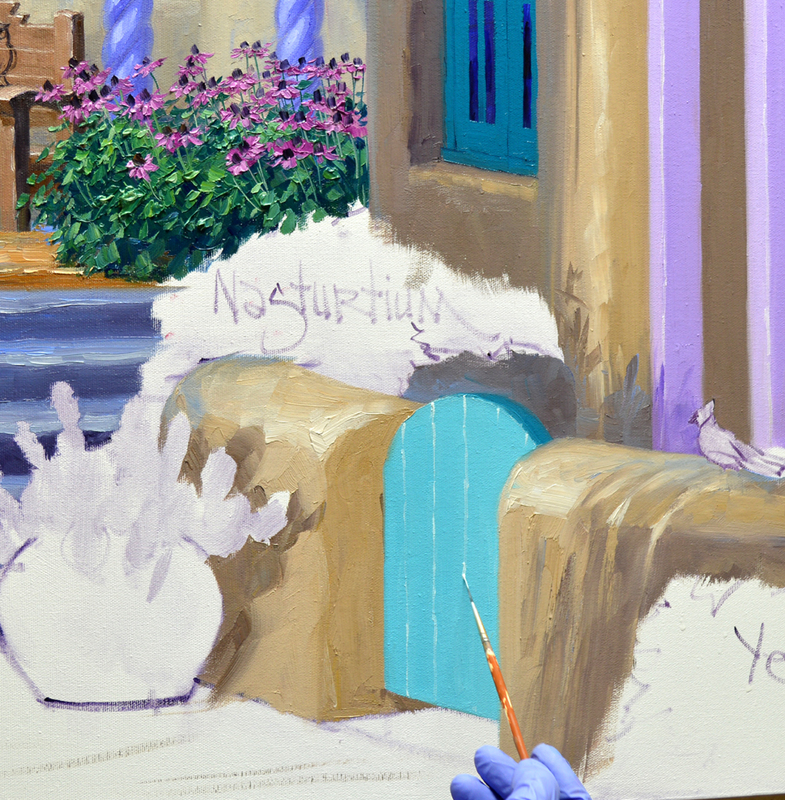 In the middle portion of the water I’ve used mixes of Ultramarine Blue + White and Ultramarine Blue + Pthalo Blue + White. 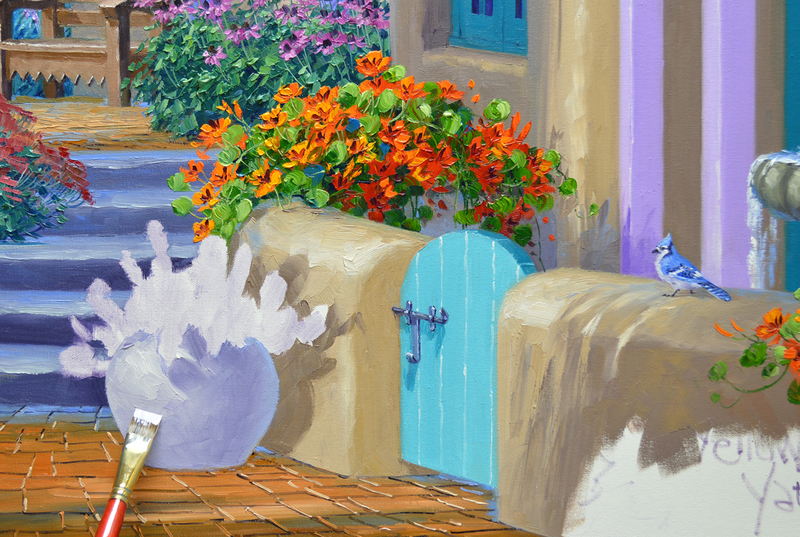 Nearest the terrace I’ll use combinations of Pthalo Blue + White and Pthalo Blue + a little Cadmium Orange + White. Now for the little Marina! I begin with the buildings. The weathered grey structure is painted with combinations of Ultramarine Blue + Cadmium Orange + MUD + White. The red ones are made of mixes of Alizarin Crimson + MUD + White. 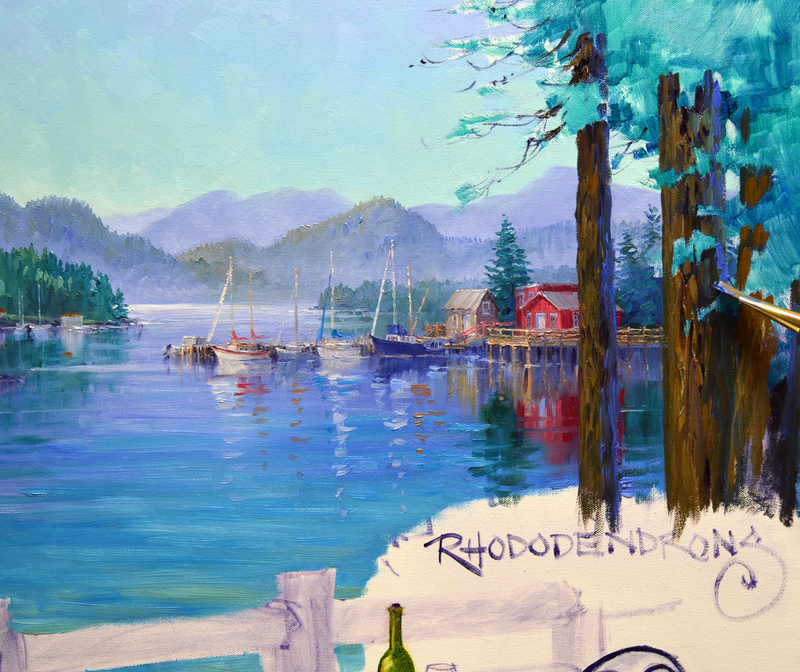 The little white dots in the mountain are where the tips of the boat masts were in my sketch. I’ll use them for reference when I paint the boats. You can see this better by enlarging the image, just click on the picture. As before, the reflections of the buildings are pulled straight down into the wet paint of the water below. Well….I decided to change the angle on the dock projecting out into the water, didn’t like the perspective. Since the boats will be in different positions now, I painted out my little reference points in the mountain! 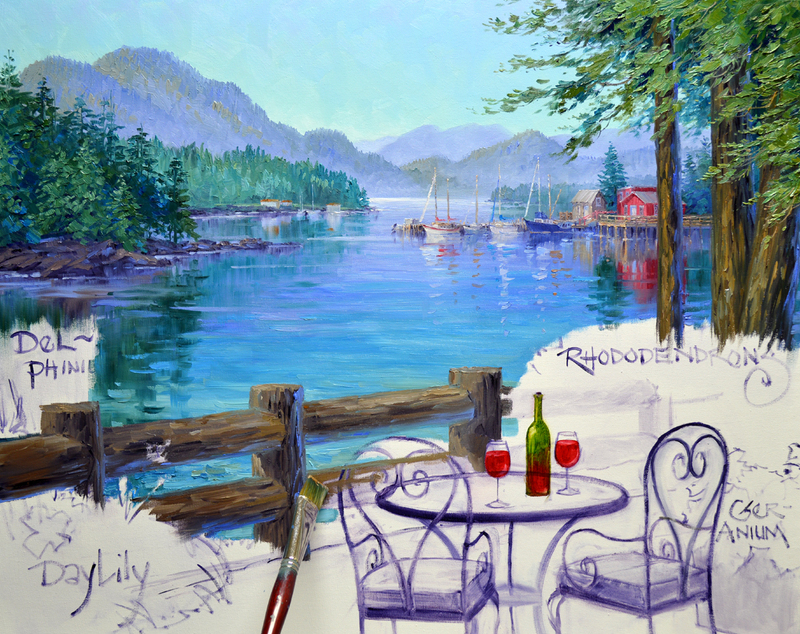 The boats are next, I paint them fairly impressionistically. I don’t want too much detail or they will have a tendency to jump forward and not stay in the background. My paint is mixed and I’m excited to get started today. We’ll begin with the sky because it sets the tone for the entire piece. 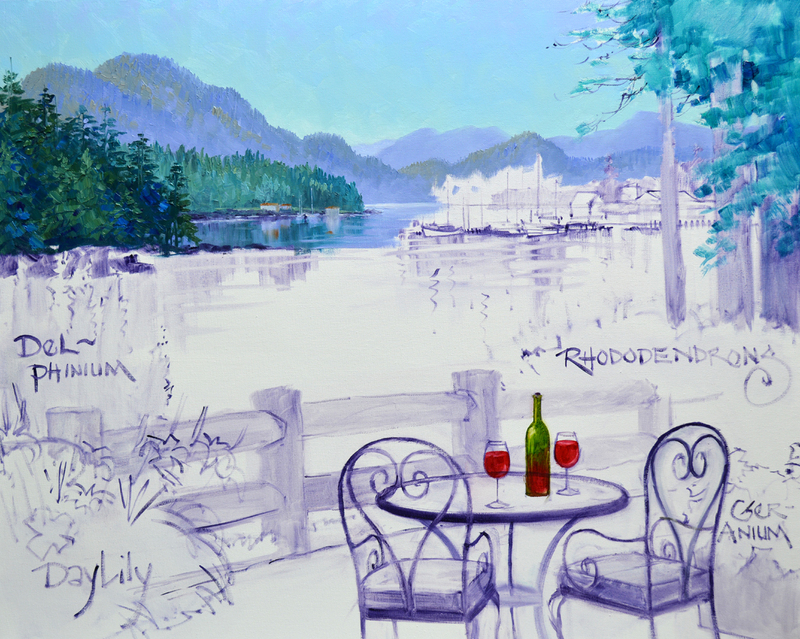 The weather report says it’s going to be a bright, sunny day in Tofino! Here are our color recipes…..#1. White + Pthalo Blue. #2. Mixture #1 + more White + a little touch of Lemon Yellow. #3. White + Cobalt Blue. 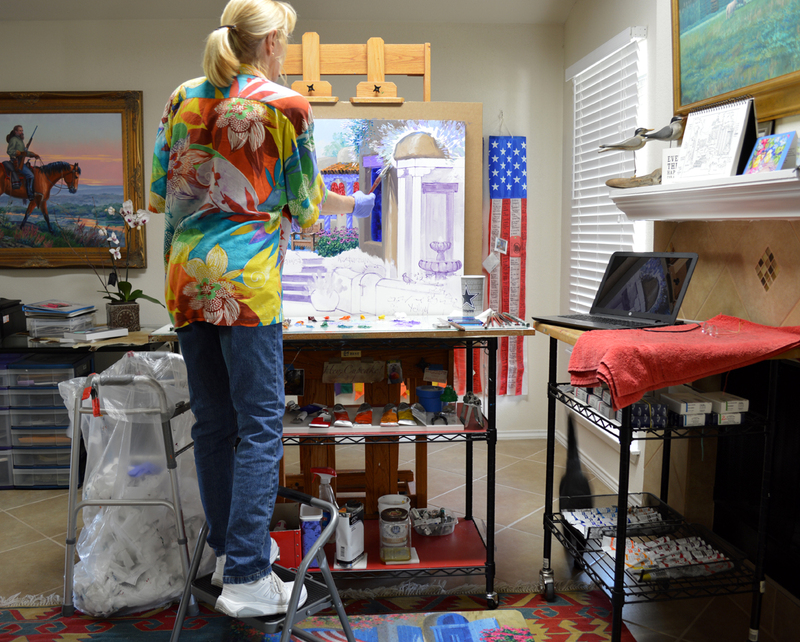 Standing on my trusty step-stool I paint the top edge of the 24 inch x 30 inch gallery wrap canvas. The upper part of the sky is made of mix #3. Moving downward I feather in some of mixture #1. The lightest mix #2 is reserved for the sky nearest the horizon, just above the tops of the distant islands. Oh, speaking of islands, this is one of the Hawaiian shirts from my collection that Jack has gotten for me over the years. If you’d like to see the picture larger just click on the image. 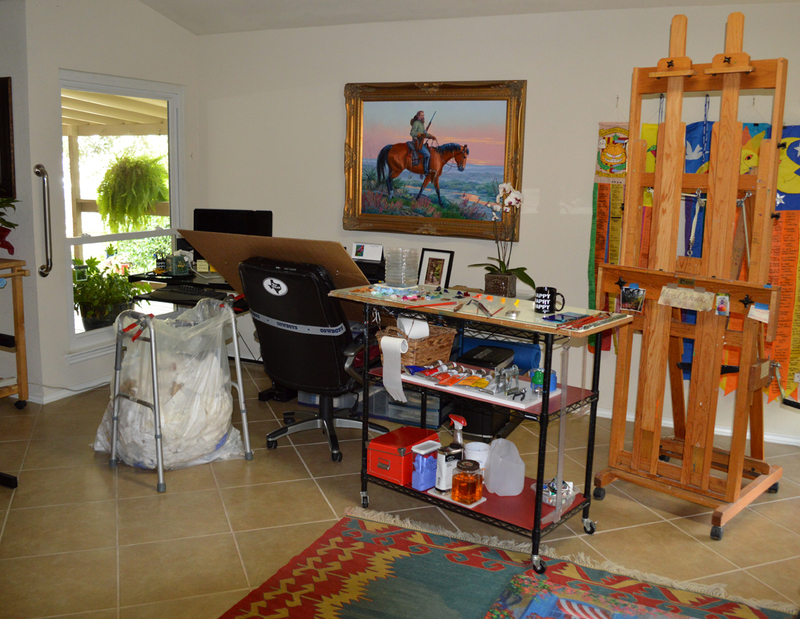 I work in the total opposite direction from sketching the basic plan up on the canvas. 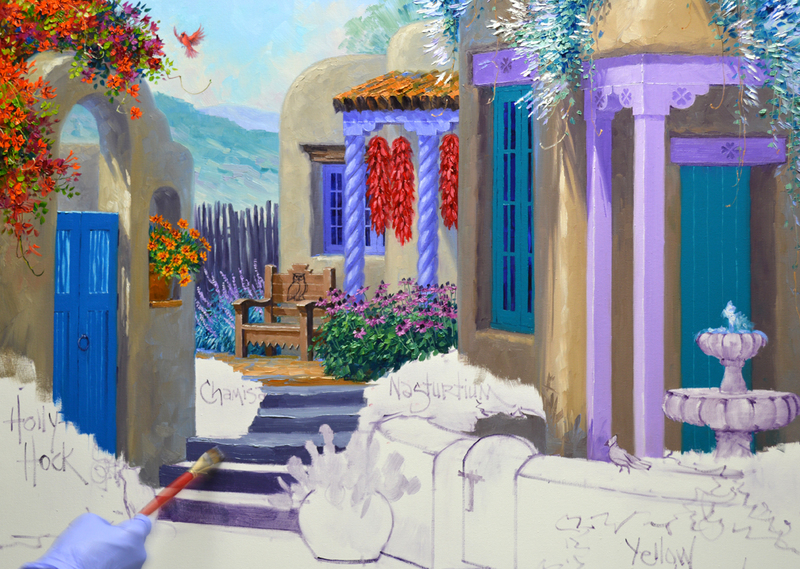 Then I did the foreground first. 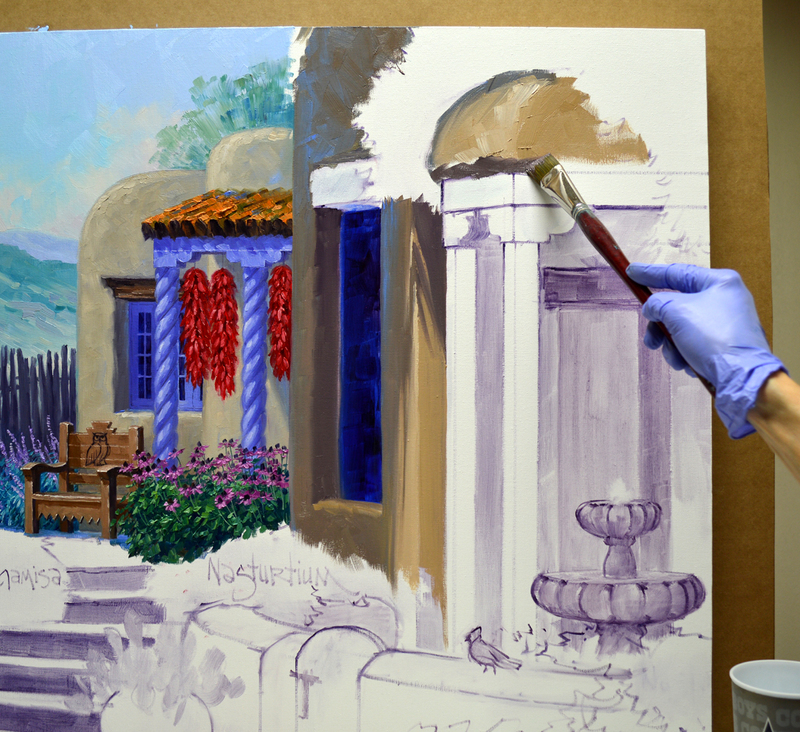 Applying opaque color I “Paint Forward”. This means painting the sky to begin, then the mountains that are the farthest away. They are made bluer and lighter with a mix of Ultramarine Blue + White so they recede. The next layer is made a bit warmer, a combination of Ultramarine Blue + MUD (Ultramarine Blue + Alizarin Crimson) + White is used. 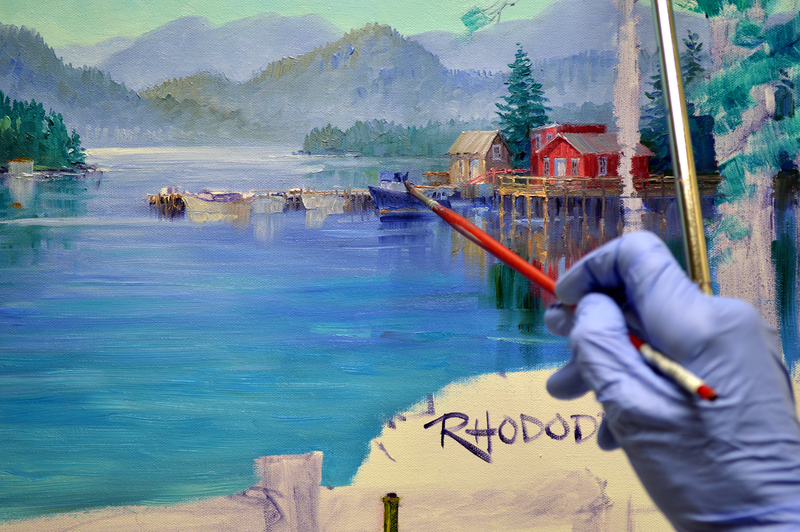 Meares Island is warmed up more by adding mixes of Ultramarine Blue + Cadmium Orange + Pthalo Blue + White. 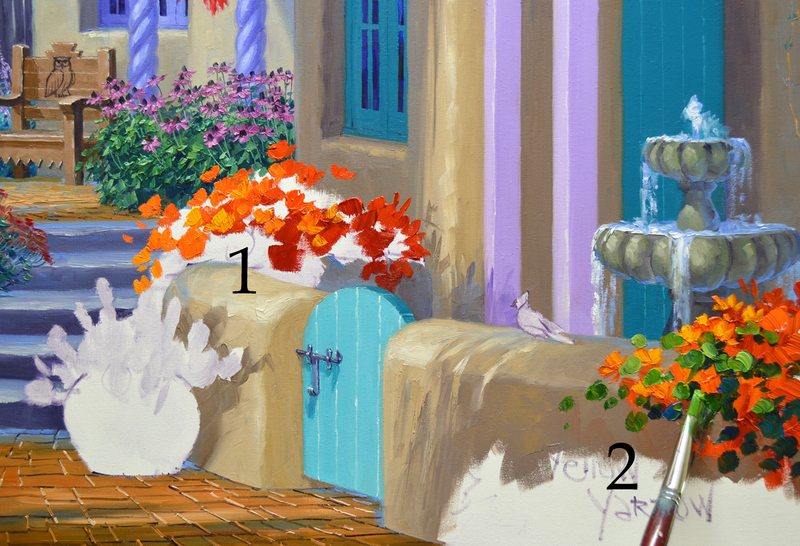 One way to give the feeling of depth in a painting is to use the rule: Cool Colors Go Back, Warm Colors Come Forward. You can already see how that is starting to work. 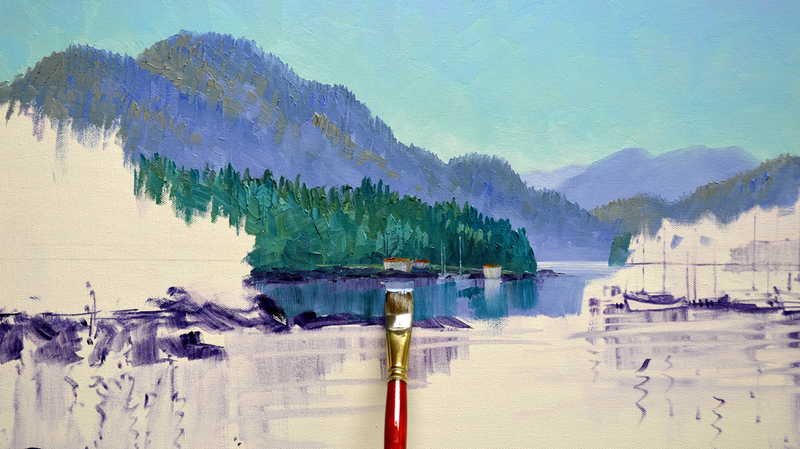 The island directly in front of Meares Island is a cool green mixed with several combinations of Pthalo Blue + Cadmium Orange + White. A little MUD is added into some of the mixtures to darken them a little. However, as cool as these greens are they are warmer than the color used on Meares Island. A few structures hug the shoreline. 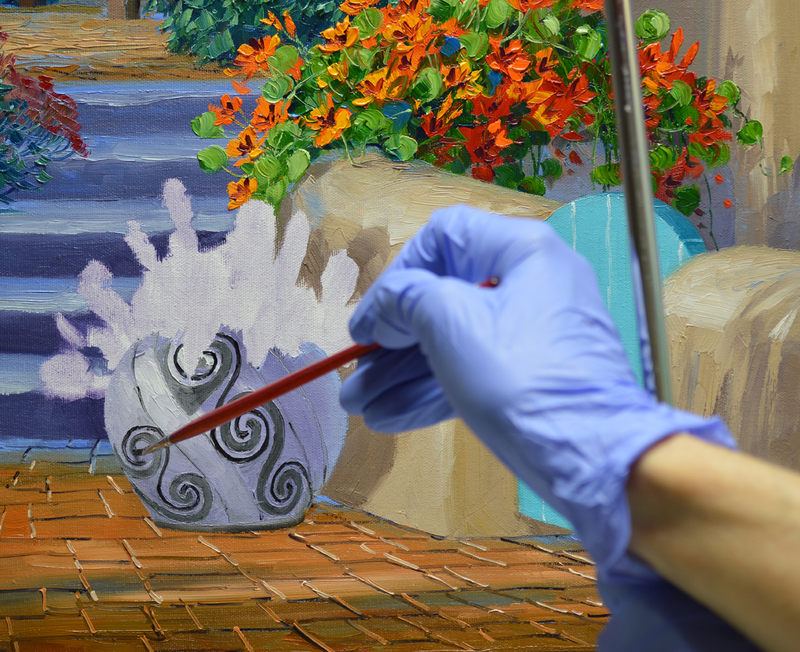 I’ve gone ahead and blocked in the water around the island so I can pull the reflections straight down as I’m painting the buildings. Also decided to put in a couple of sailboats just for good measure. The closest island is made of richer greens. I’ve used various mixes of Utramarine Blue + Cadmium Orange + Cadmium Yellow Medium. 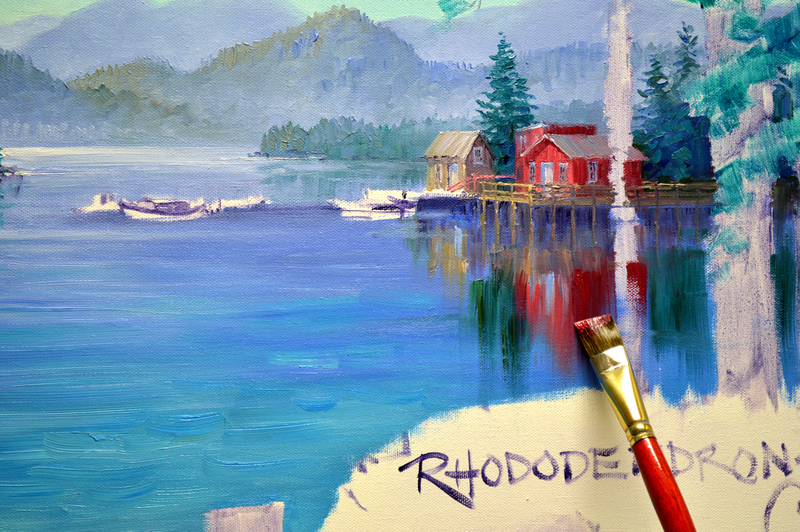 A few brushstrokes of Pthalo Blue + White are dabbed here and there to bring coolness into the island forest. We can see another theory of making a painting have depth at work here: Darker Objects Advance, Lighter Ones Recede. 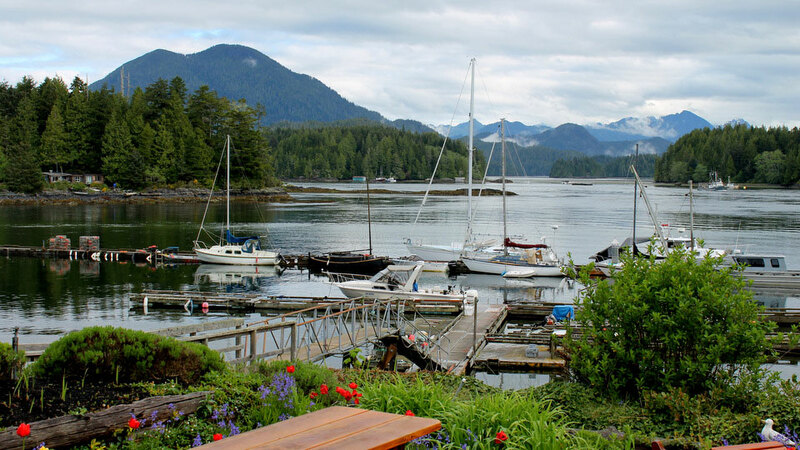 All right….how many of you have heard of Tofino? That’s where we’re headed today. 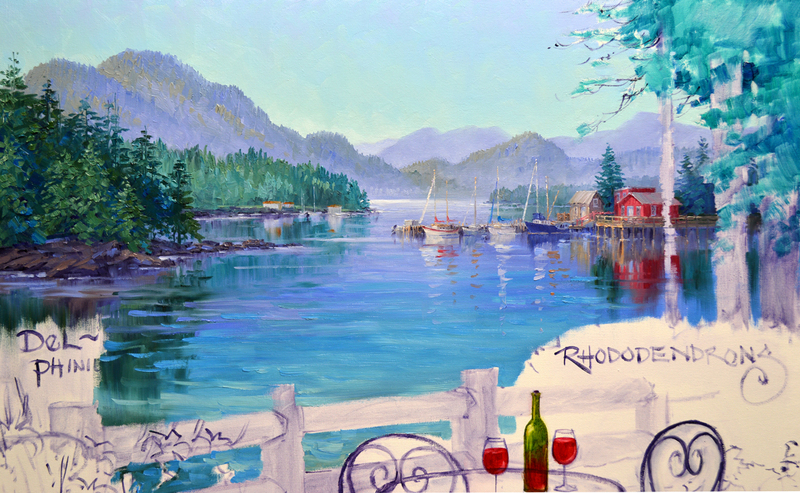 This commission features the quaint, little fishing village located on Vancouver Island in British Columbia, approximately 300 miles north of Seattle. I’m using the photo at the top as a guide for the background of my sketch. 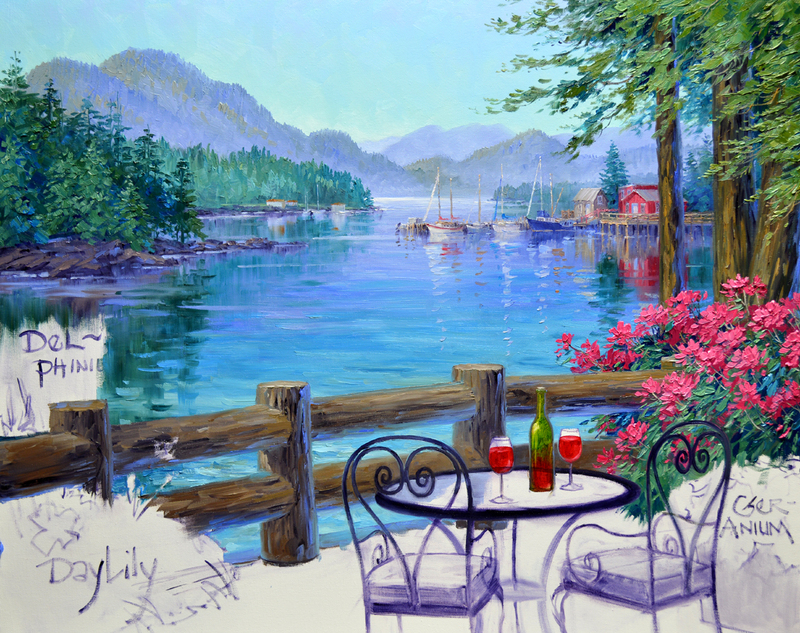 We’ll have a terrace in the foreground with lots of rich, jewel tone flowers. As you read through my blog please remember, you can click on any of the images to see them larger. 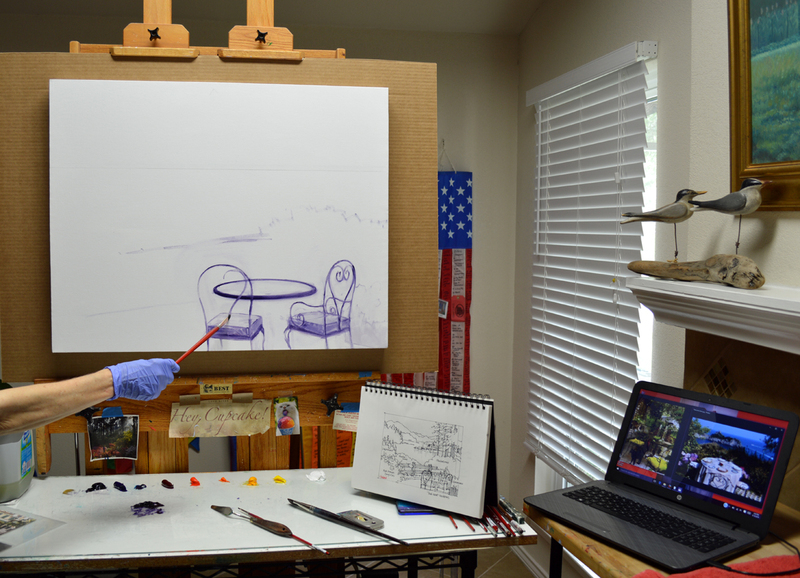 After penciling in the horizon line about 1/3 of the way down the canvas, I begin drawing the table and chairs with a brush dipped in a thin oil wash made of MUD (Ultramarine Blue + Alizarin Crimson) + Liquin. 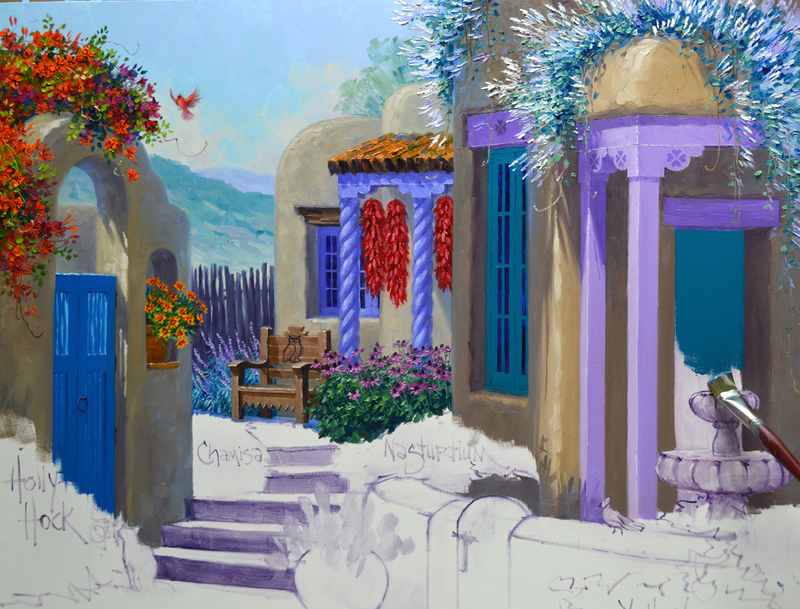 I start with these foreground elements because the placement of everything else in the composition is based on them. The reference photos for the chairs are on my laptop. 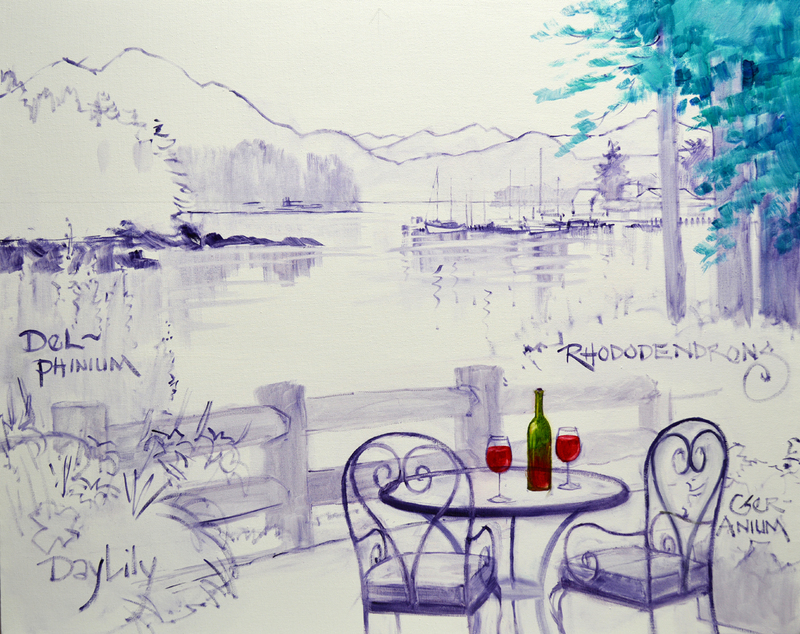 Now that the terrace and flowers are sketched up on the canvas I’ll move to the background mountains. The largest one is Meares Island. I love all of the small islands in Browning Pass. 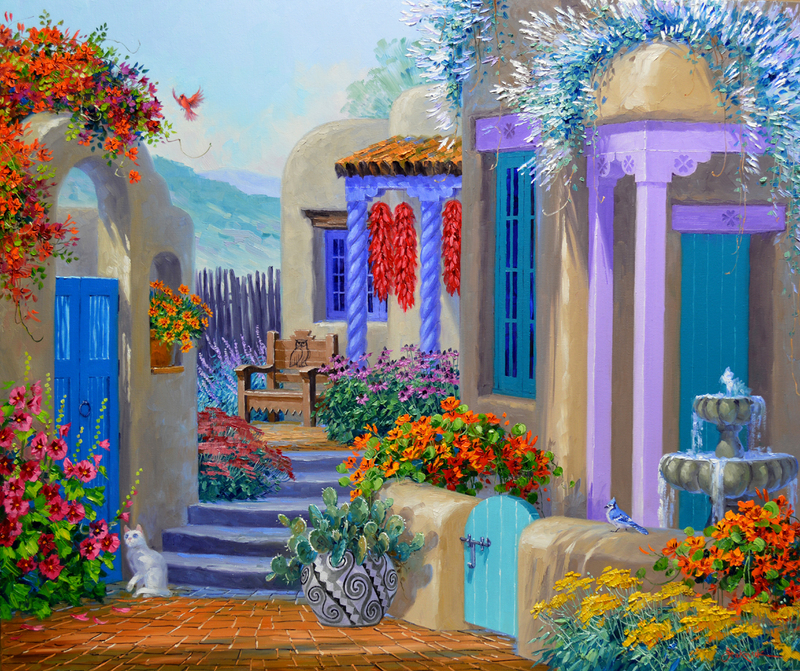 The way they overlap will help give a feeling of depth to the painting. 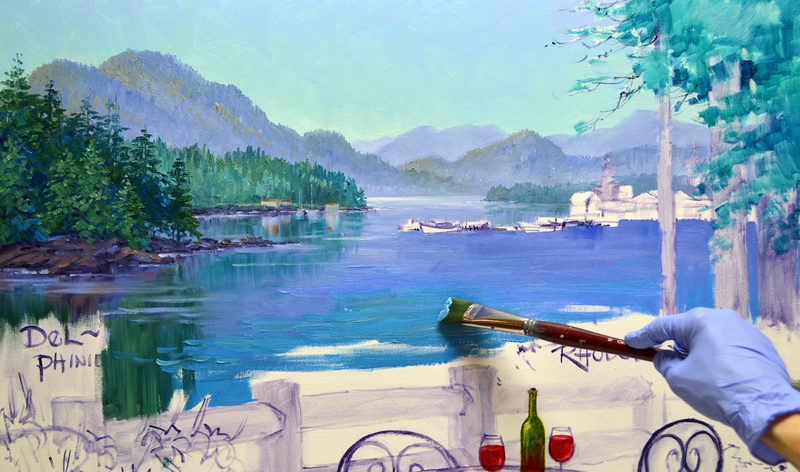 Next I come back to the foreground and draw in the trunks of the large fir trees at the edge of the terrace. 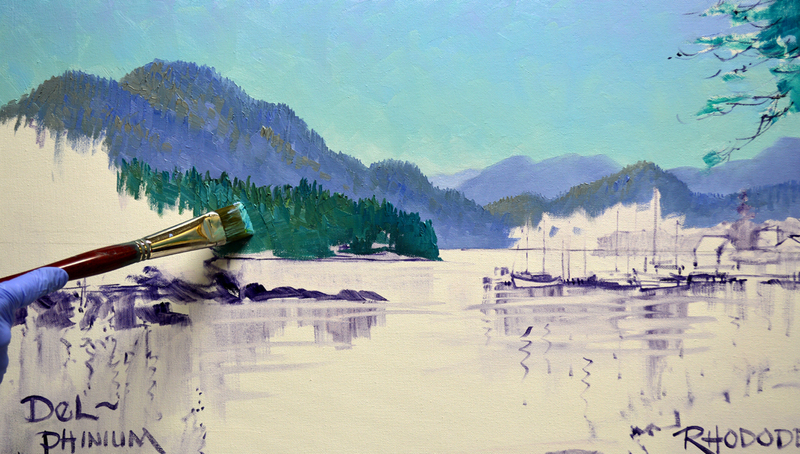 It wouldn’t be Tofino without BOATS! Lots of Sailboats, as well as fishing vessels, reside safely in the marina across from our terrace. The wine bottle is washed in with Sap Green. 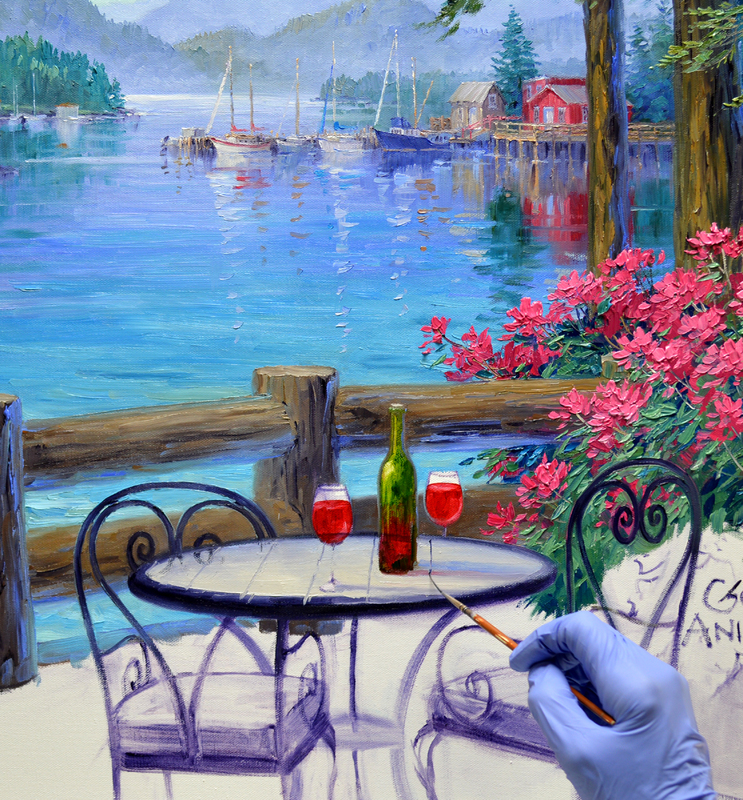 Alizarin Crimson has been added to the lower portion to give the impression of wine still in the bottle. It is also used to indicate the wine in the glasses. 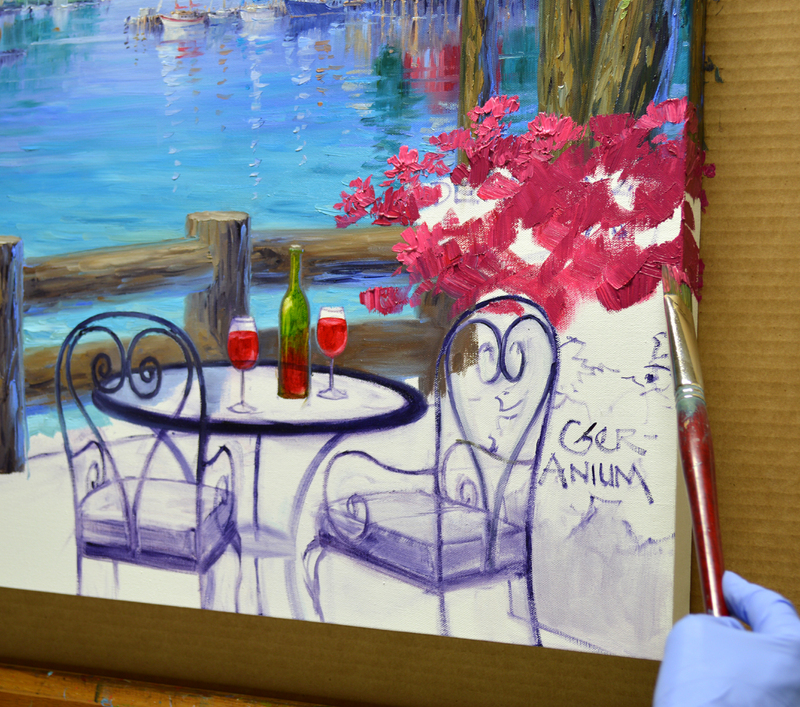 I’m just covering the canvas at this stage, I’ll come back in a later session and paint the bottle and glasses. 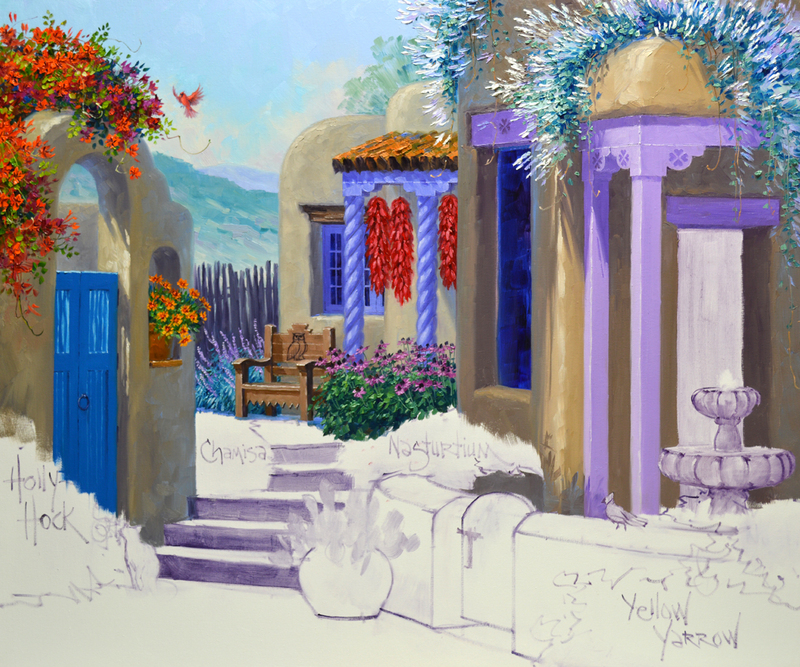 The basic layout on the canvas is finished, it will serve as a road map to follow as I paint. Hope you’ll come watch! If you would like to receive an email every time I publish a new post you can subscribe to my blog. CLICK THIS LINK and scroll to the upper right side of the page. You will see a heading EMAIL SUBSCRIPTIONS. Just enter your email address and click the button “Sign me up!” It’s easy. And if you enjoy my blog please CLICK the FaceBook LIKE Button. As we say in Texas, “Much Obliged! The water streaming from the upper bowl of the fountain is dragged, straight down over the background that is now dry. 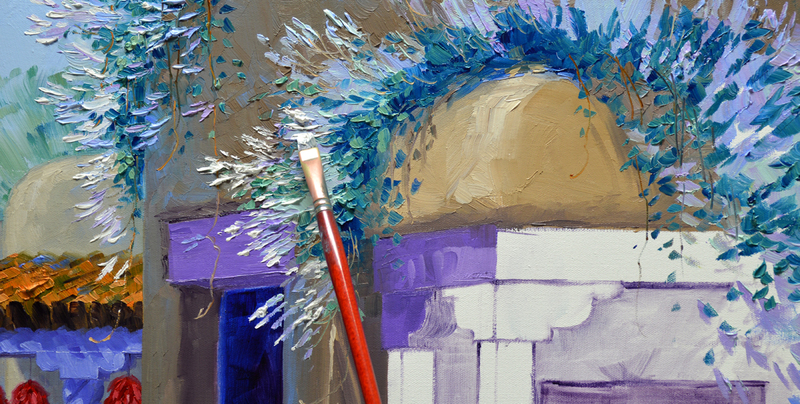 I hold the brush lightly, letting it skip and bump over the rough paint underneath. This helps to give the impression of falling water. Delicately fragrant Nasturtiums are blocked in Flowers First, Leaves Last. #1. 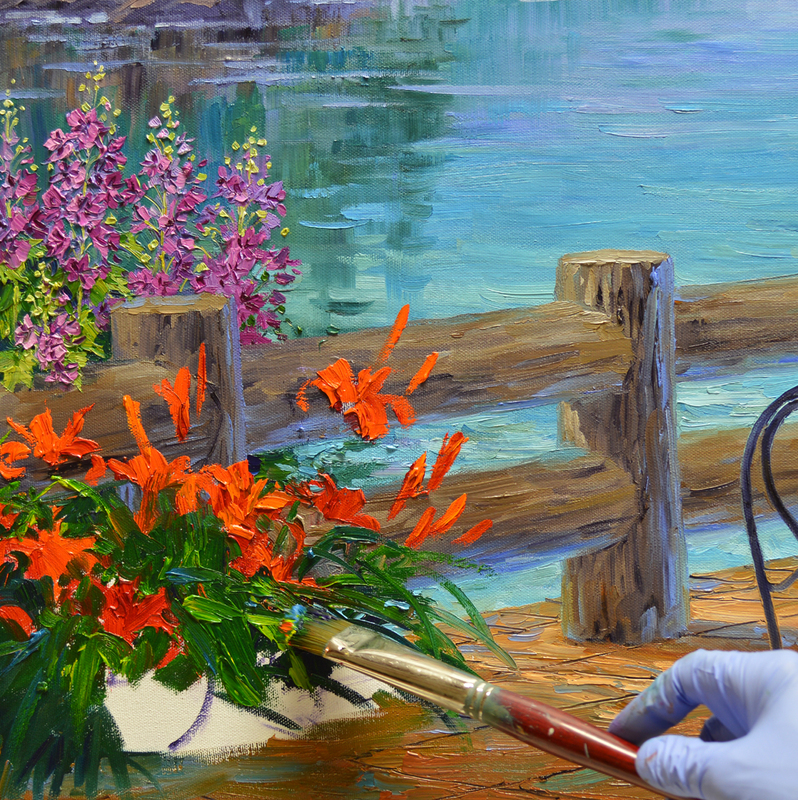 The blossoms are mixtures of Alizarin Crimson + White, Alizarin Crimson + Cadmium Red Light, Cadmium Red Light + Cadmium Orange and Cadmium Orange + Cadmium Yellow Medium. #2. 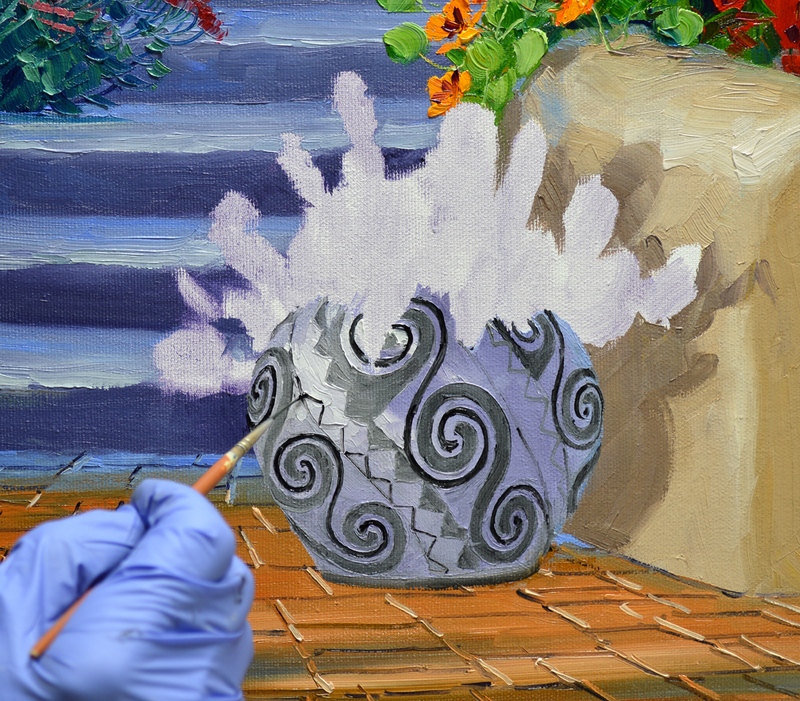 Round leaves made of various combinations of Pthalo Blue + Cadmium Yellow Medium are painted around the flower color. 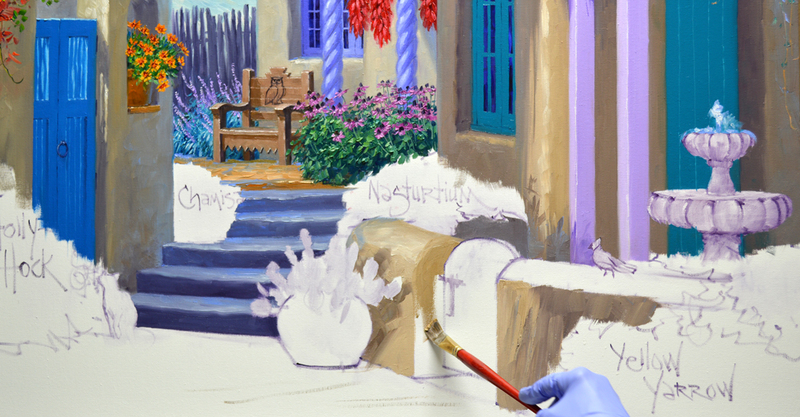 A few strokes of Pthalo Blue + White are added here and there to bring coolness into the depths of the foliage. You can click on the image to enlarge the picture to see this better. It’s fun drawing in the stems and wiggly vines with a fine liner brush. Wiggly reminds me of Jack’s nicknames for our rescue kitties. There is a grocery store chain in the south called “Piggly Wiggly’s”. He called the girls Piggly and Wiggly. Molly is Piggly because she will eat a whole bag of cat food in one sitting. She’s constantly sneaking food out of Sissie’s dish if I don’t get it put up immediately after the little one, who just eats a couple of nibbles at a time, is finished eating. Sissie is Wiggly because her tail is always wiggling! Big Blue has dropped in for a visit. I use mixes of Cobalt Blue + White for his beautiful plumage. I notice he’s keeping a sharp eye on that white cat! Black markings complete the Blue Jay. 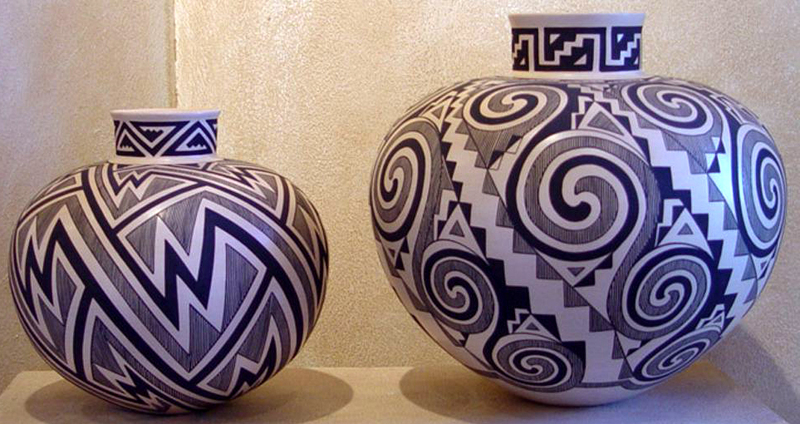 Now it’s time to paint the Anasazi Pot. I’ve debated how to approach this for some time, I do miss Jack’s advice in situations like this. But I finally decided to begin with the base color as if the container is solid white. 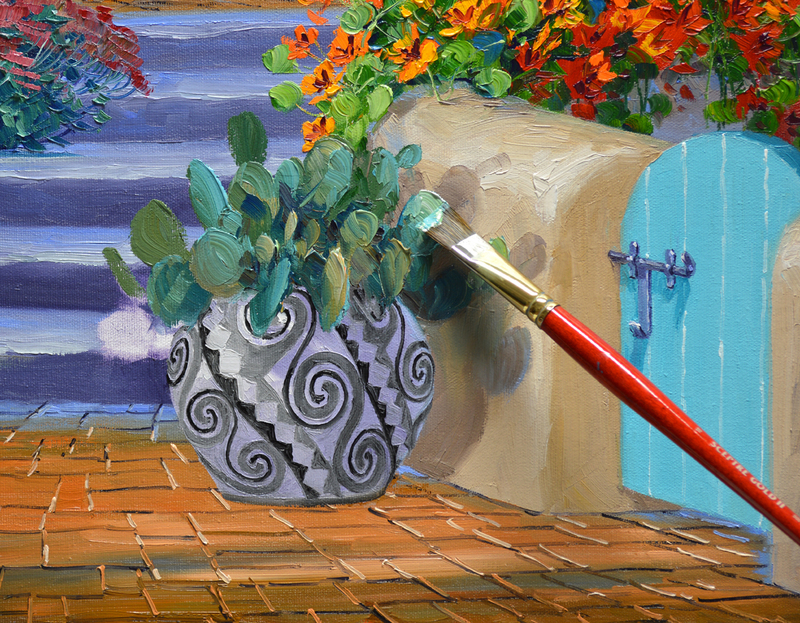 So the light and shadows on the round pot are established. Here are a couple of samples that Jeana sent. I’ve decided to paint the one with the spirals, it will be a challenge. I draw diagonal lines with Ivory Black into the wet paint of the container as a guide. Then the spirals begin! 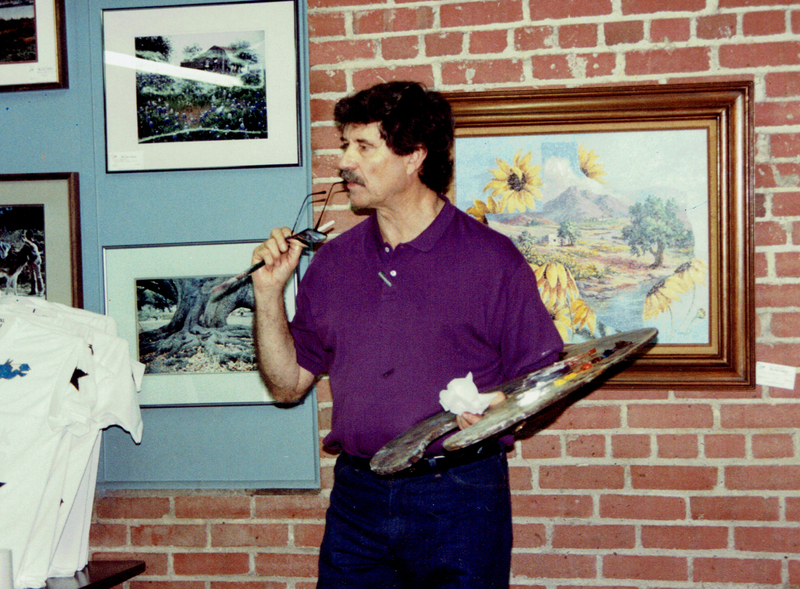 My wrist is braced against my mahl stick to steady my hand as I continue. What is a mahl stick? CLICK HERE to find out. The triangular designs are first outlined, I’ll come back and fill them in. WHEW! The Anasazi Pot is done, time to plant the Prickly Pear Cactus. Watch out for those stickers, they can be painful. I’ve learned from experience to wear heavy gloves and hold the pads with a couple of layers of cardboard when planting the real thing! Jeana has always wanted a white cat with blue eyes. She was thrilled when Chloe, her Siamese, had an all white, blue eyed kitten. But soon Nathan’s ears, nose and tail started to darken. 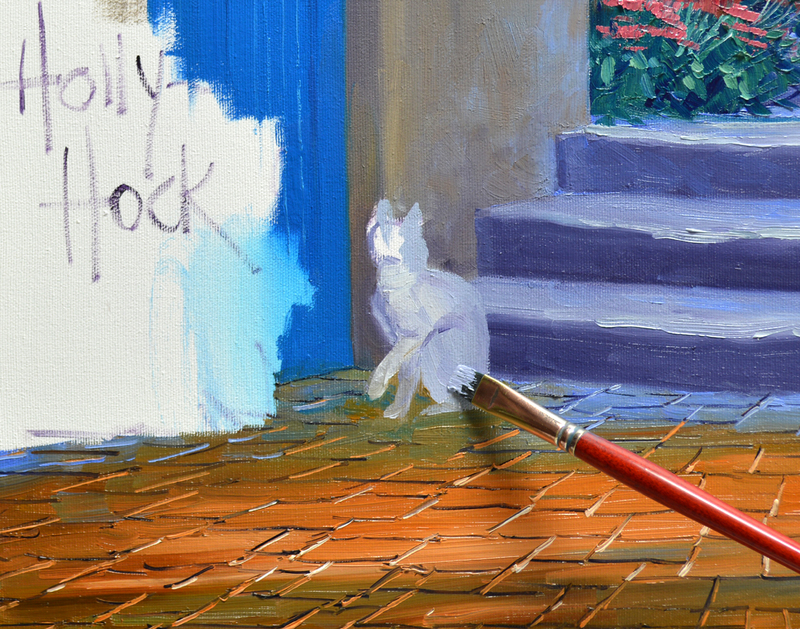 So it seems the only way to get her white kitty is for me to paint her one. 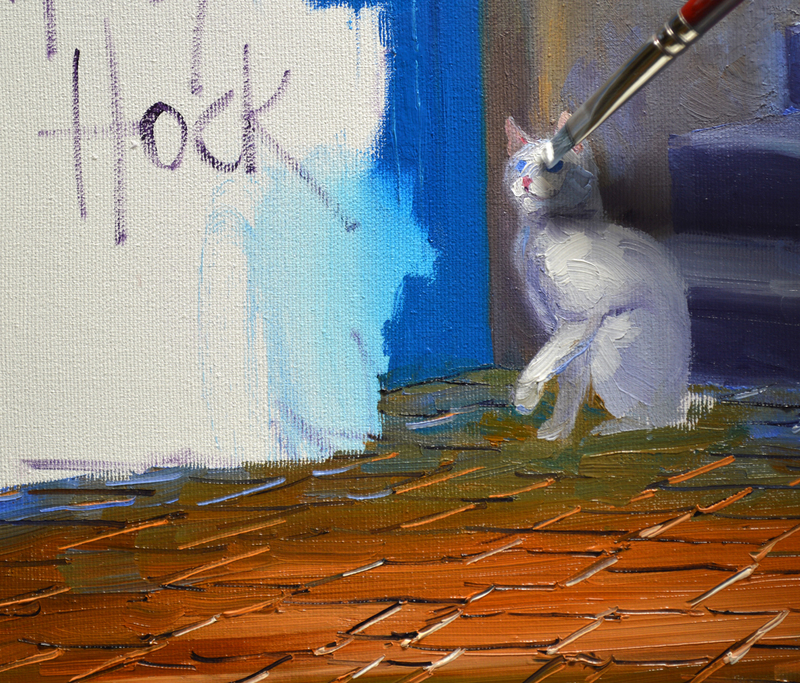 I begin by blocking in the basic feline shape with soft greys made of White + Ultramarine Blue + a little Cadmium Orange + MUD (Ultramarine Blue + Alizarin Crimson). Next her blue eyes, pink nose and ears are finished. Then pure White highlights are thickly painted on her face, shoulder and left paw where the sun streams through the Hollyhocks. The bright blossoms of the Hollies are blocked in with mixtures of Permanent Rose + Alizarin Crimson + White and Permanent Rose + White. 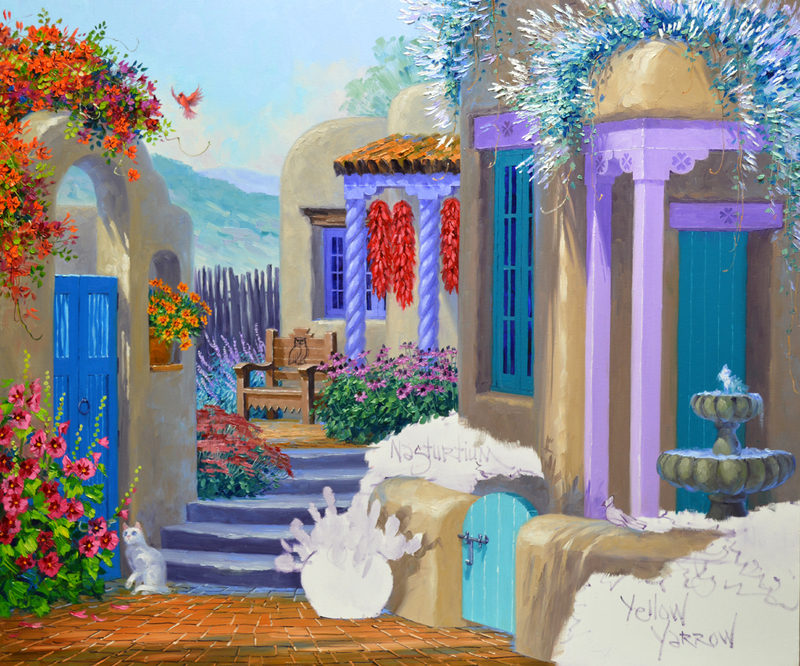 Intense greens made of Pthalo Blue + Lemon Yellow are used for the foliage. 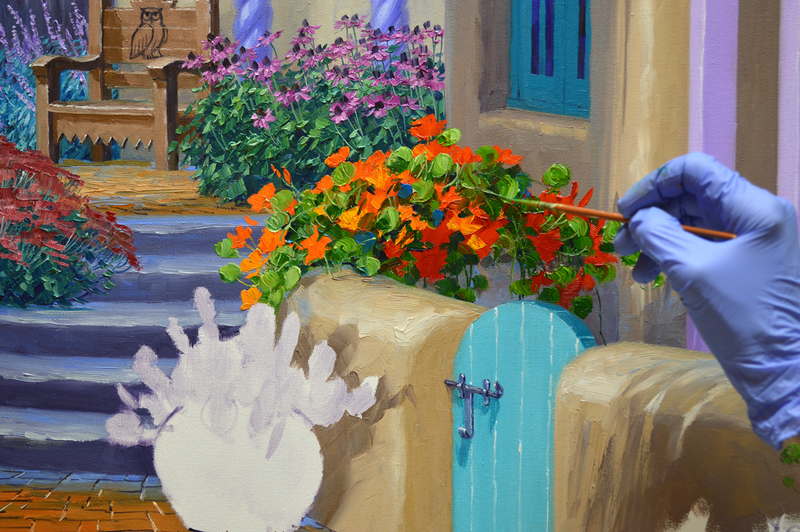 Then highlights are added to the large crepe papery flowers. A little intruder has sneaked into the garden, but he can’t escape the kitty’s watchful eye! 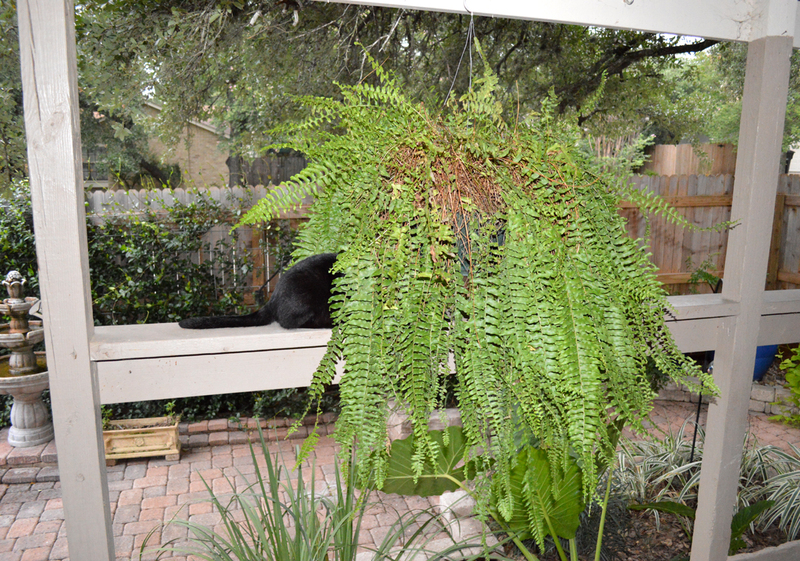 Can you spot our visitor? You might have to enlarge the image, just click on the picture. 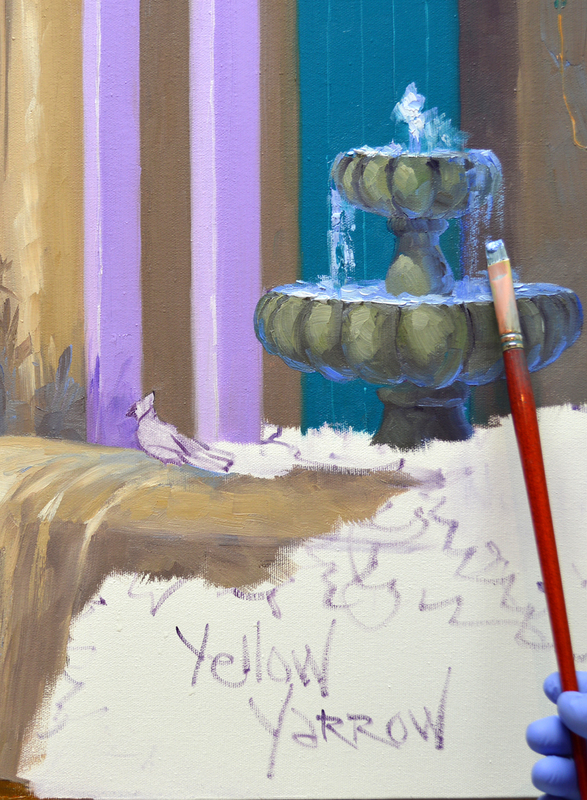 The southwest style fountain is painted with mixtures of Viridian Green + Cadmium Orange + White. A little MUD is combined with the mixes for the darker shadow values. Blue, from the water below, reflects up onto the underside of the fountain bowls. We have more planting to do in our next session. I have to get a new pair of gardening gloves, I discovered a hole in one of mine this morning! But before we go let’s take a trip WAY BACK down memory lane. 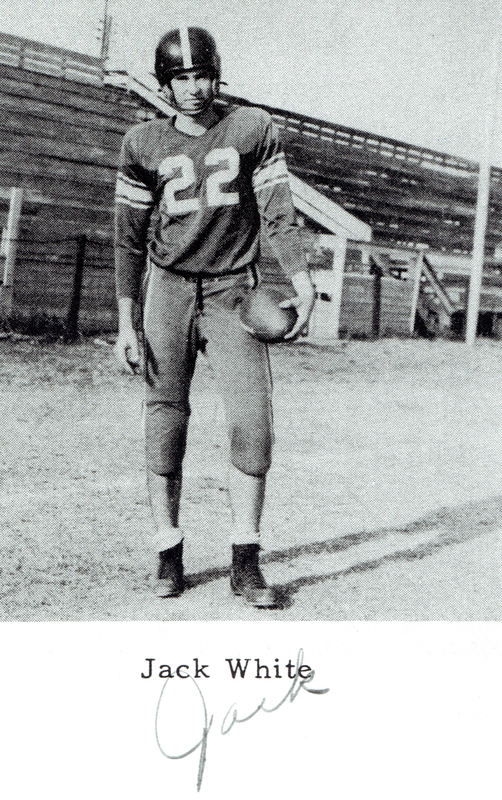 This is “Our Jack” in high school! 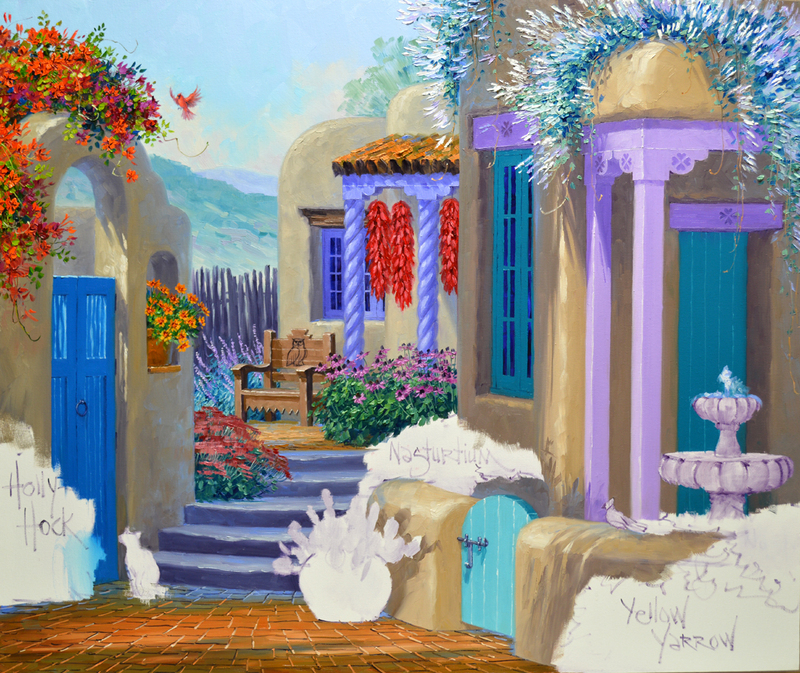 The door and window are painted with Rembrandt Pthalo Turquoise Blue, a deep rich color I’m unable to mix with our palette. Doesn’t it look nice with the lavender posts, corbels and beams? There is a simple rule to follow when painting steps or stairs: The upright plane is always darker than the top of the step. This is because more light hits the flat surface than the vertical one of the riser. Using some of the paint mixes left over from the house, the low courtyard wall surrounding it is now blocked in. White is added to the door mixture to make the gate washed by the sun. The edges of the individual boards are highlighted using a fine liner brush. Rusty Chamisa snuggles at the base of the wall under the container filled with cheery Coreopsis. If you’d like to see any of the images larger just click on the picture. Now the entire surface area of the irregular terra-cotta paver floor is painted, establishing the light and shadow pattern. 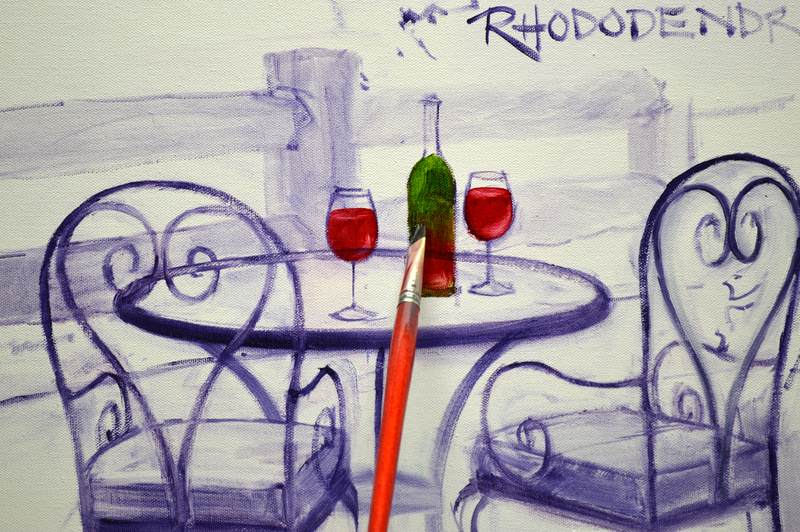 Perspective lines are next drawn into the wet paint. Then the horizontal crevices between the rough tiles are indicated with a fine liner brush dipped in a mix of MUD (Ultramarine Blue + Alizarin Crimson) + Liquin. Would you like to know more about our Double Primary Mixing System that Jack developed? Just CLICK HERE! 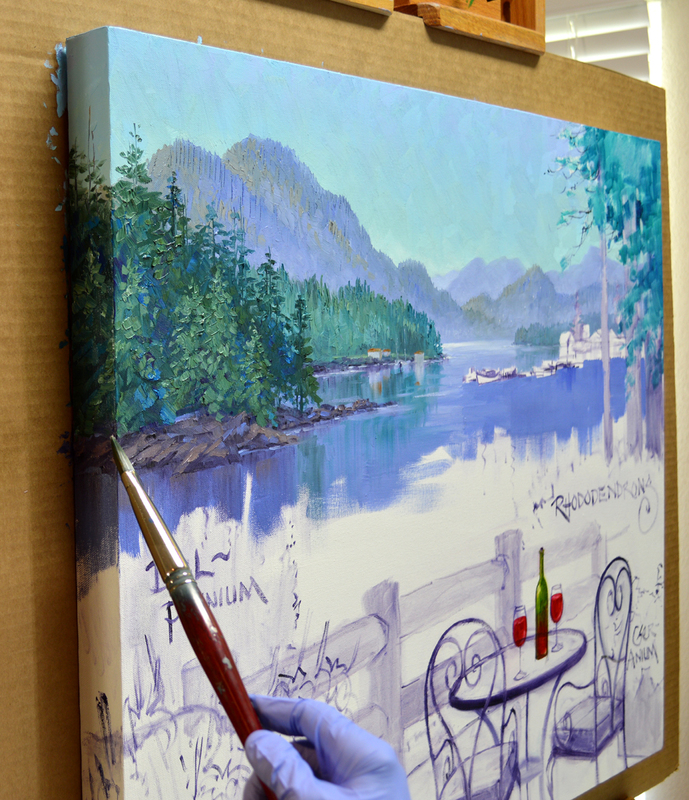 To paint the bottom edge of the gallery wrap canvas I usually place the painting on top of my taboret. BUT….Molly has taken it over as you can see in the background! So I grab Jack’s chair, place the top of the cardboard on the desk and rest the bottom on the seat back. 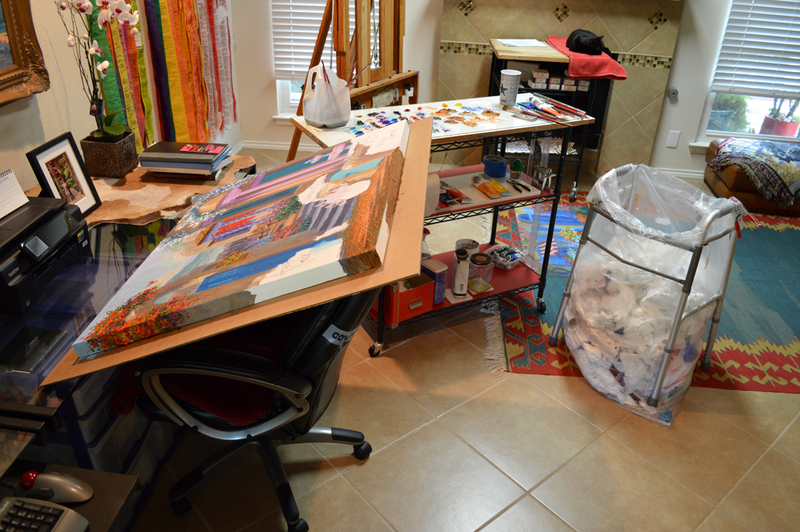 All of our studio furniture is on wheels, I just roll my palette over and I can paint the underneath side of the piece. Our garbage bag is draped over an aluminum walker and clipped with utility clamps. The bottom edge is fully covered with the shadow color. Perspective lines continue over the edge of the canvas. TA DA, the paver floor on the bottom surface is done. Flowers will flow over on the lower right side. The color of the rounded adobe structure on the right is warmer and richer than that of the other buildings so this one will appear to come forward. One of my readers asked why I wear gloves….it’s because the paint thinner dries my hands out. The skin around my fingernails splits into painful cracks, the gloves have been a perfect solution. I have to admit though, it took awhile to get used to them! 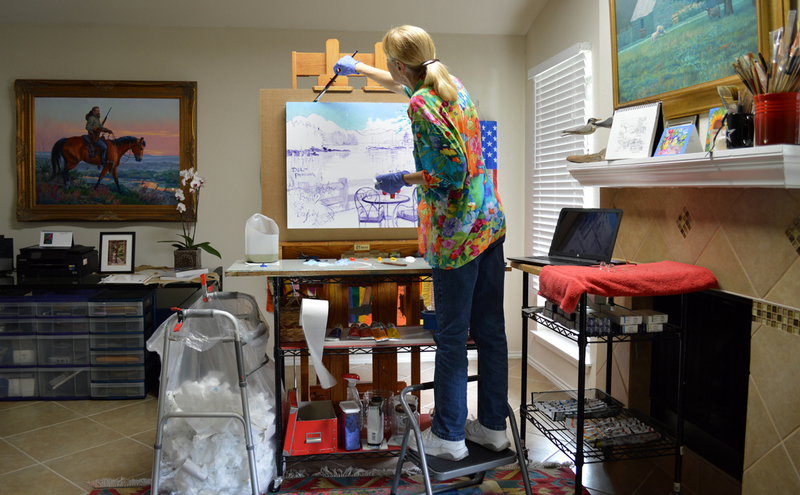 I stand on a step stool to paint the top edge of the gallery wrap canvas. 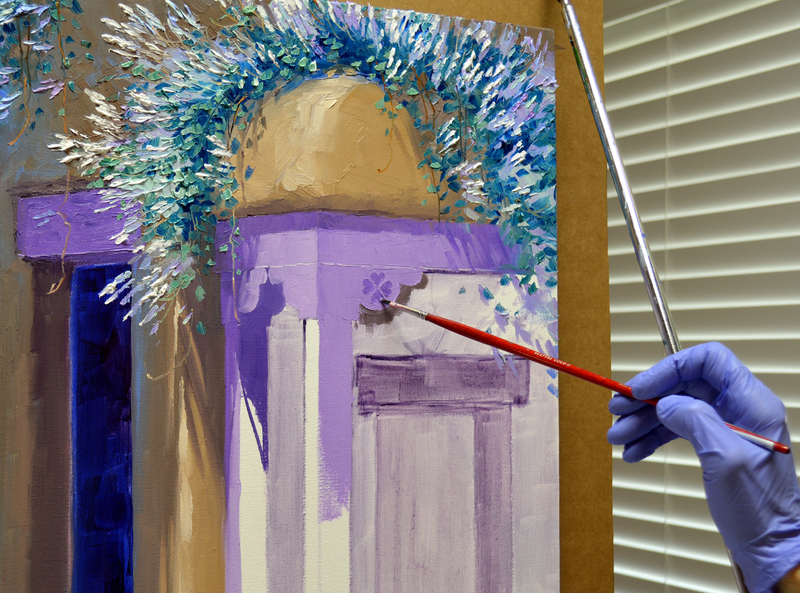 While up there I block in the white flowers of the Silver Lace Vine cascading over the roof with mixtures in various proportions of White + Dioxazine Purple, White + Ultramarine Blue and White + Pthalo Blue. 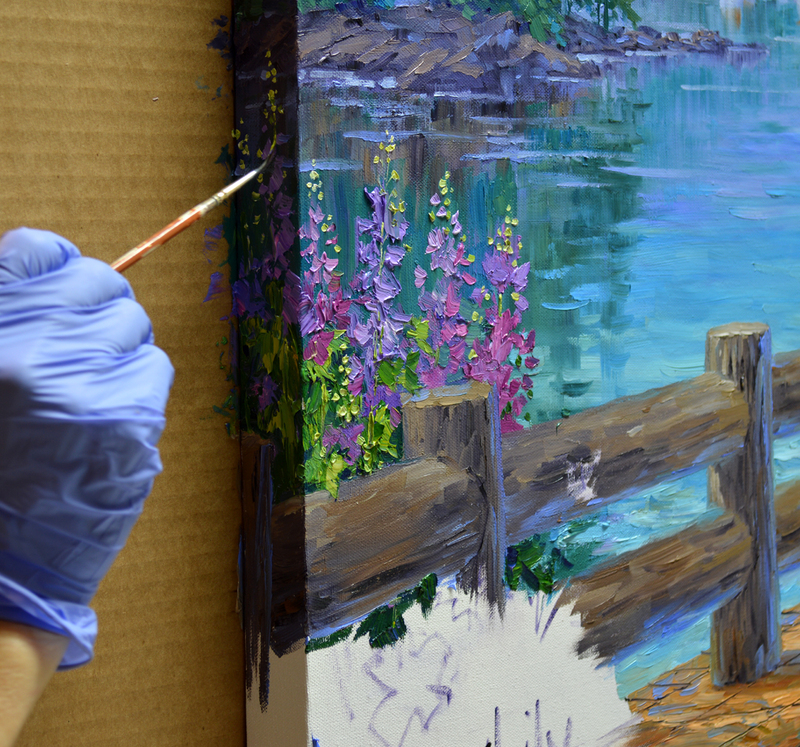 Working wet-into-wet the foliage color is painted around the blossoms, helping to give them shape. The leaf mixes are combinations of Pthalo Blue + Cadmium Orange + White. The icing on the cake is to highlight the long slender blossoms dancing in the sunlight with Pure White. The beams and posts are a lovely lavender made of Dioxazine Purple + White. A four leaf clover design is carved into the curved corbel. 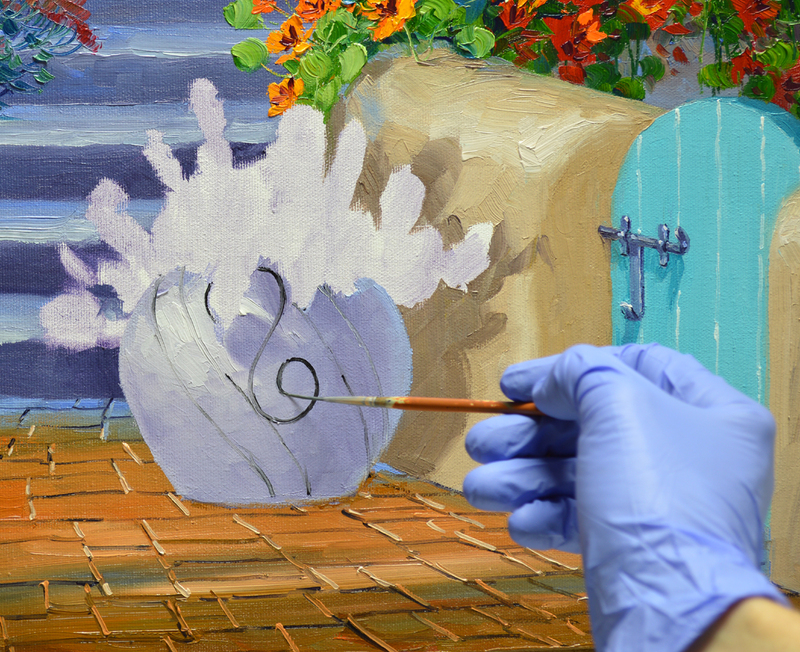 My wrist is braced against the mahl stick to steady my hand as I delineate the motif. The leaves are actually little hearts! 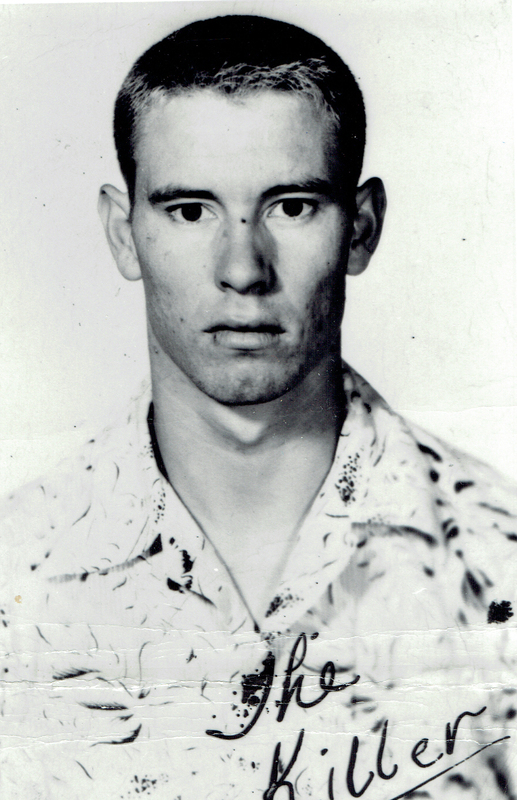 You can click on the image to see it larger.